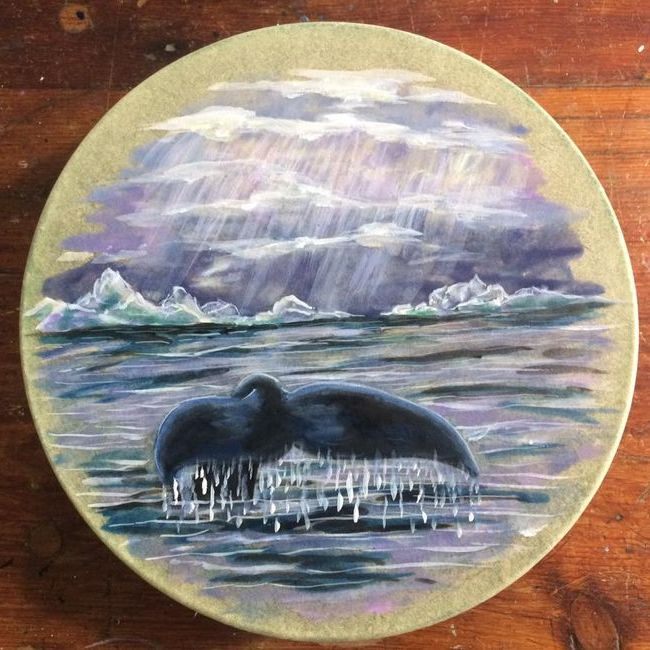 Gayle’s Greenlandic name is Aanaa Naammagittartoq - Grandmother Patience. 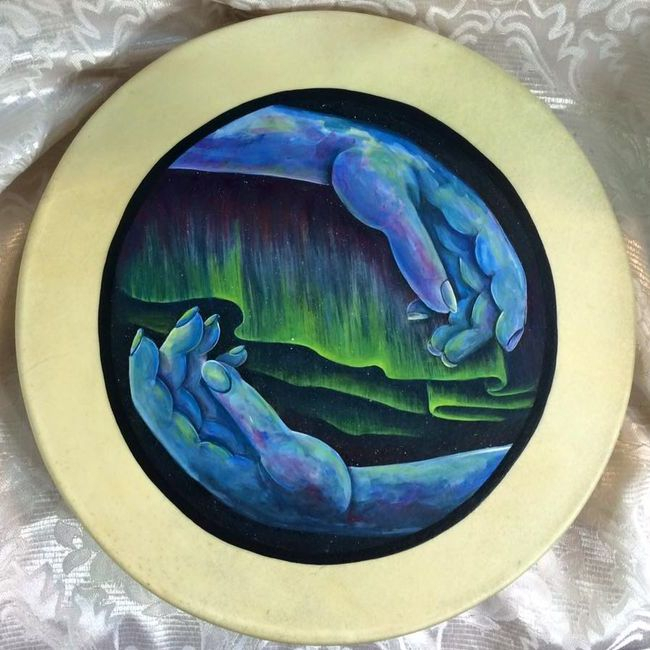 She is Angakkoq/shaman initiated under traditions of Greenland by Angaangaq Angakkorsuaq at Icewisdom International. 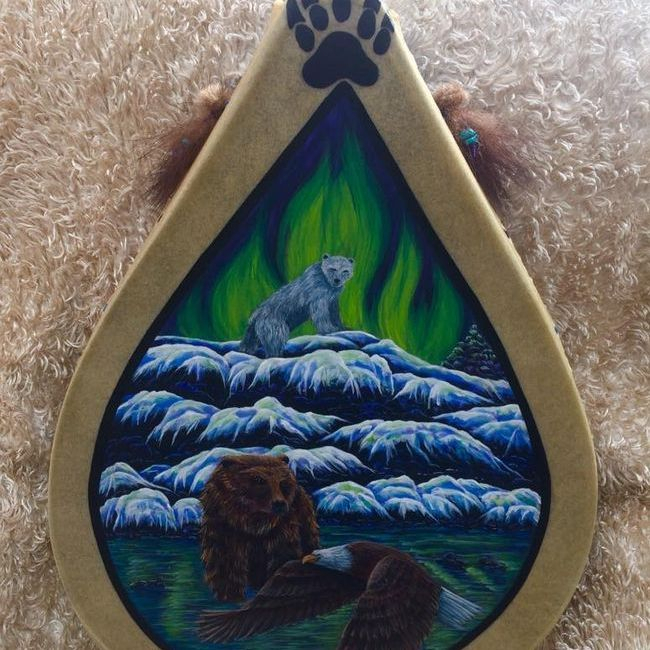 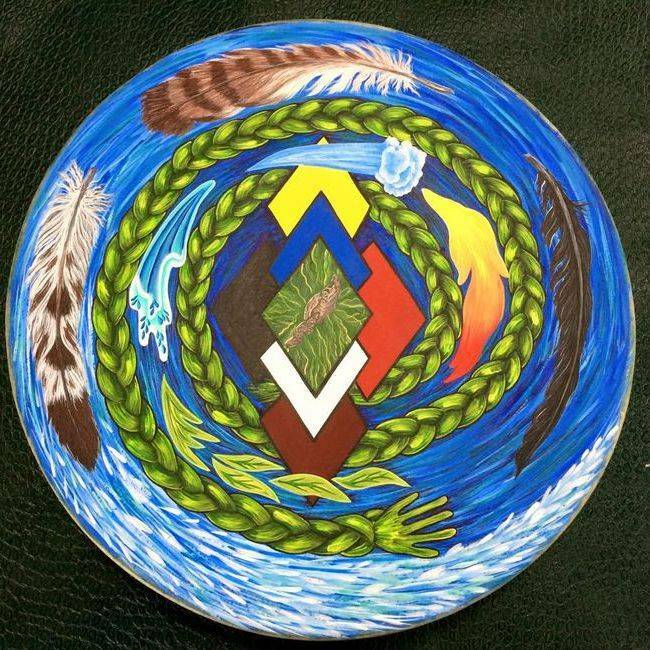 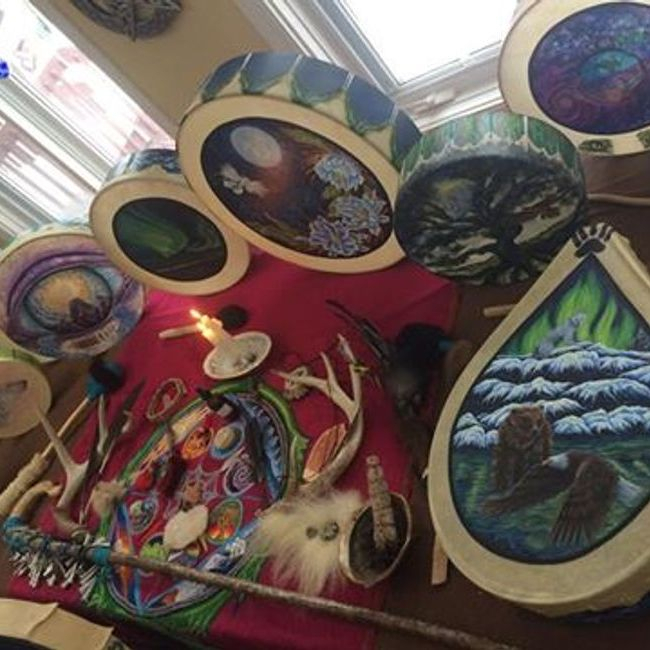 Gayle is a cherished Elder who has been honoured by other Elders, Wisdom Keepers, and Shamans around the world and by those whose lives she has touched. 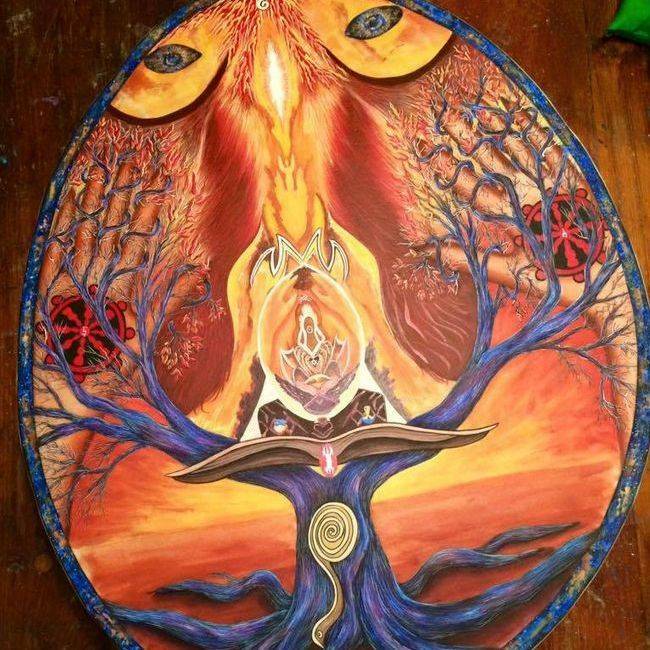 Opening our minds to a higher consciousness, a spiritual awakening is the new frequency in this shift in energy. 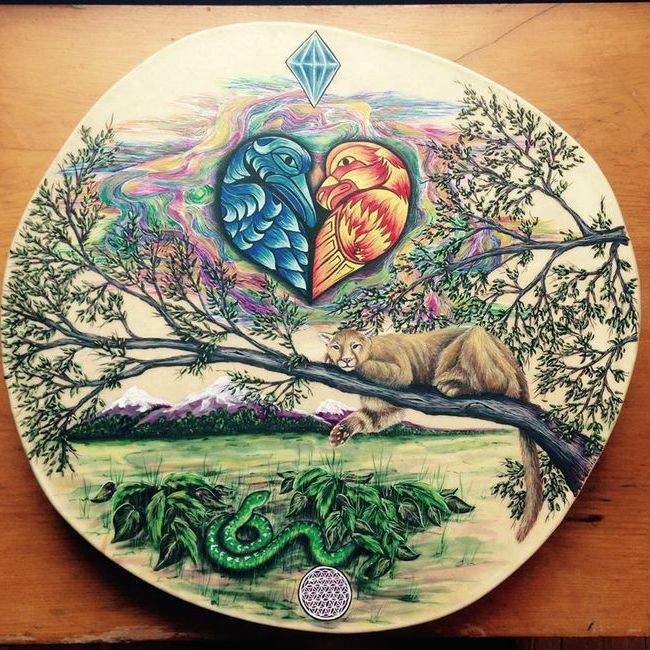 Uncover your true purpose, your life path by aligning yourself with others who are celebrating their rainbow energy. 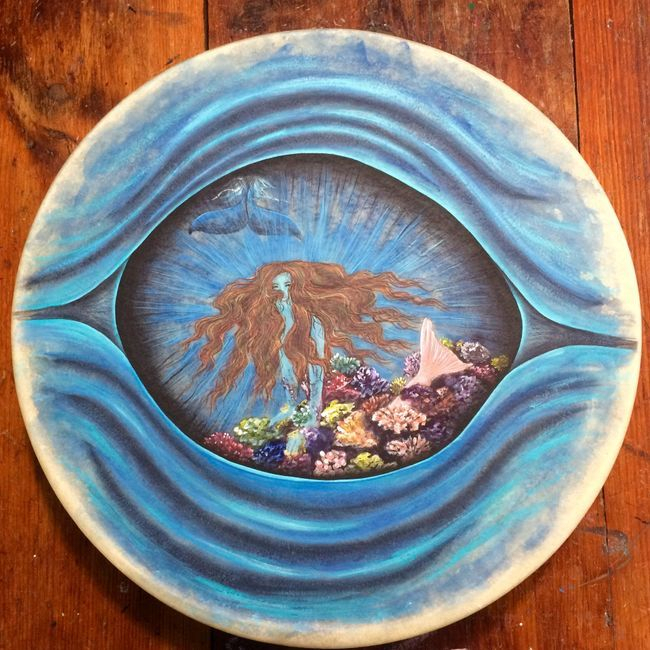 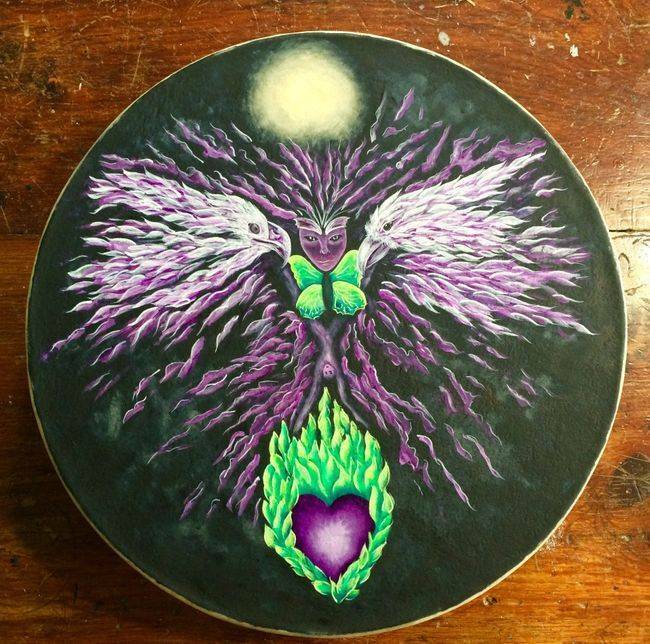 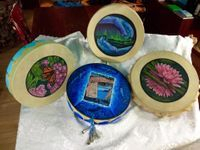 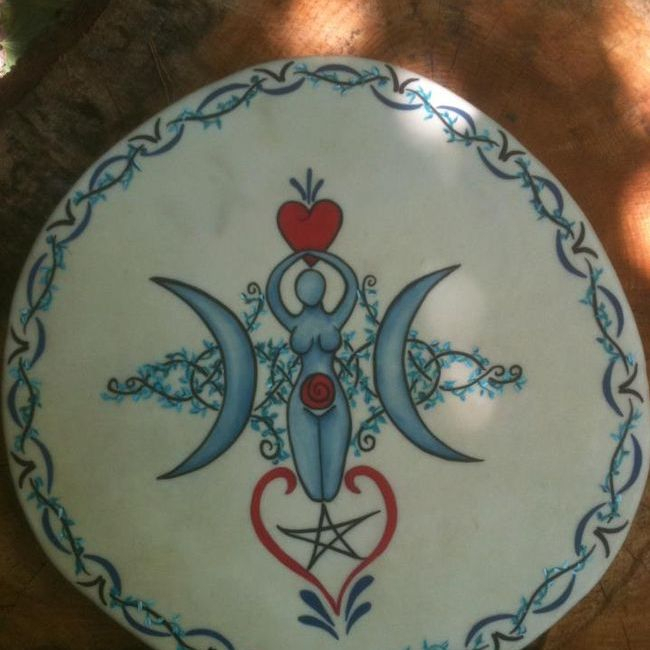 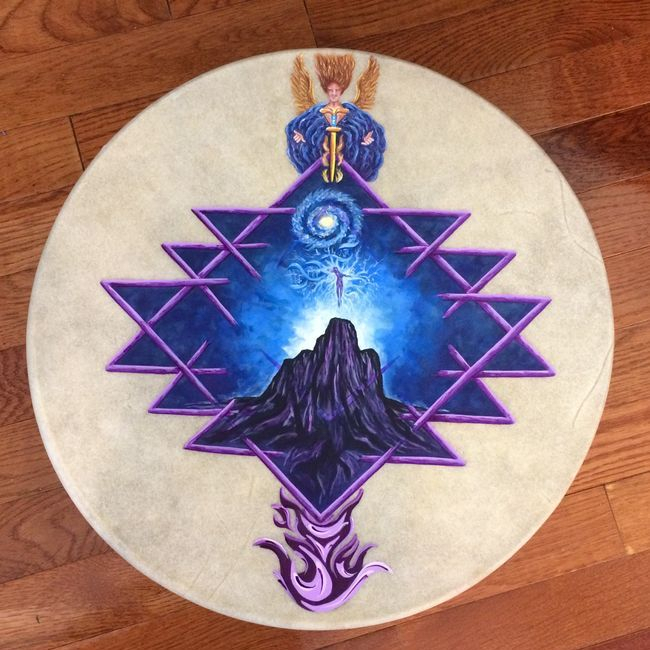 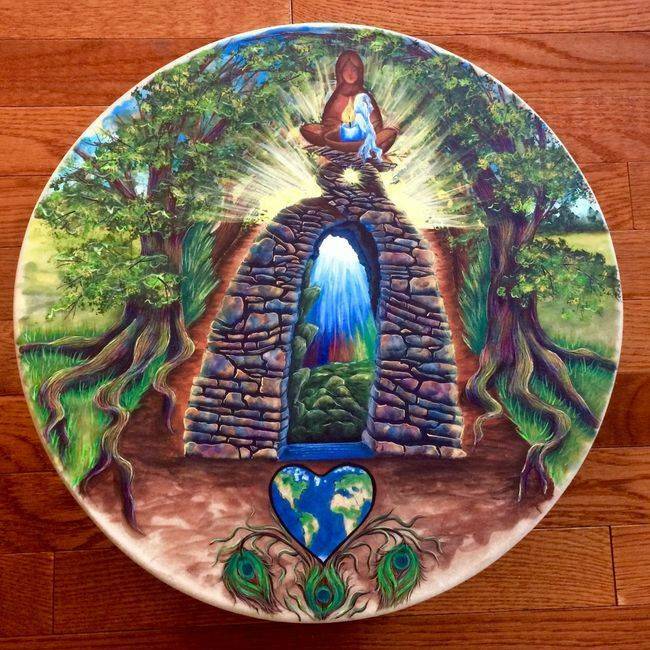 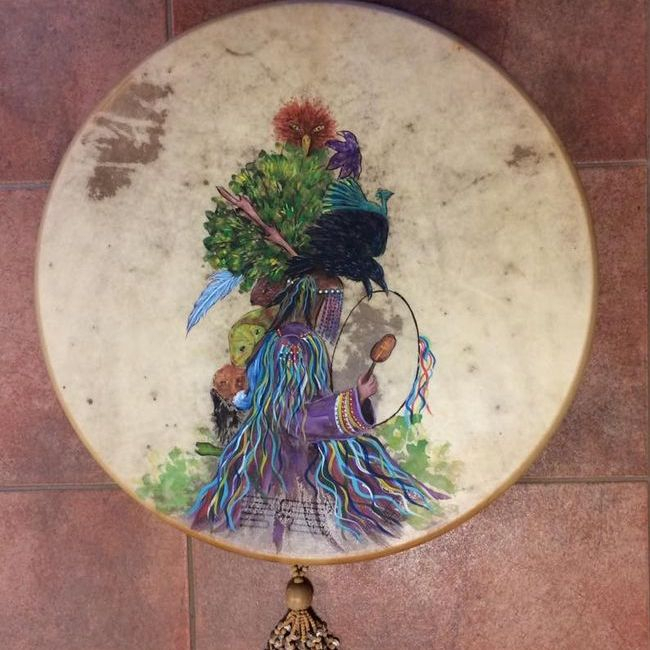 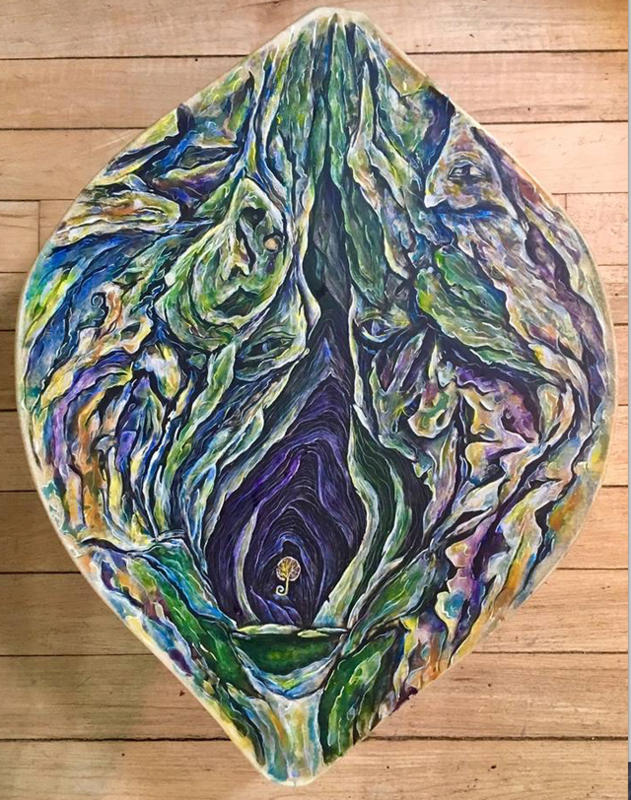 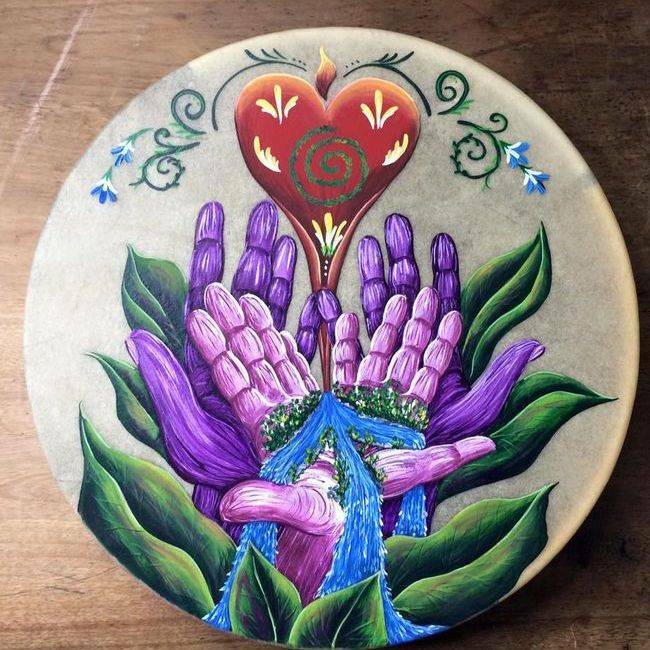 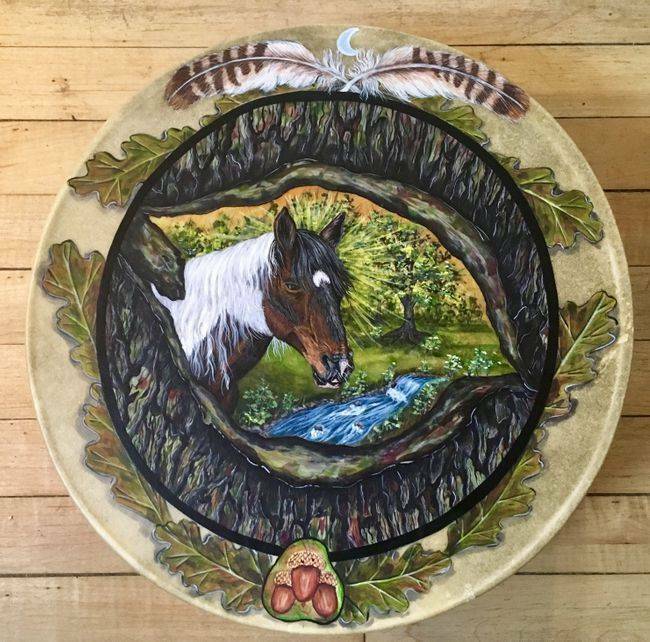 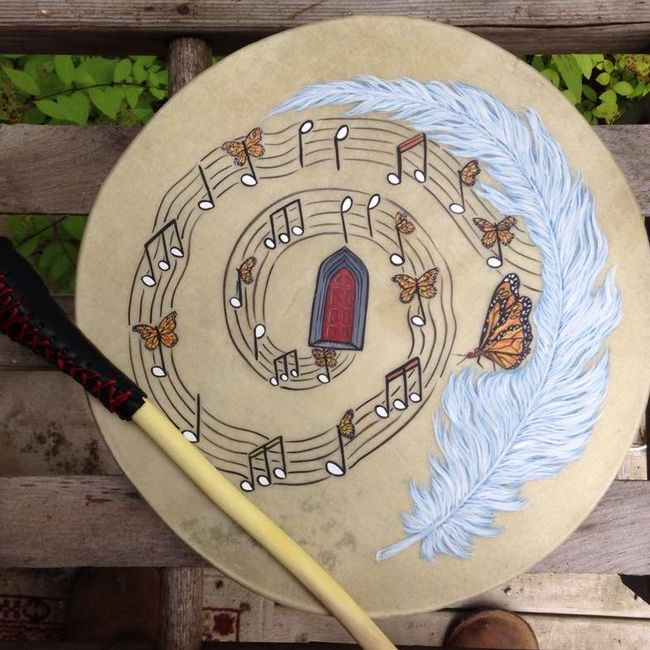 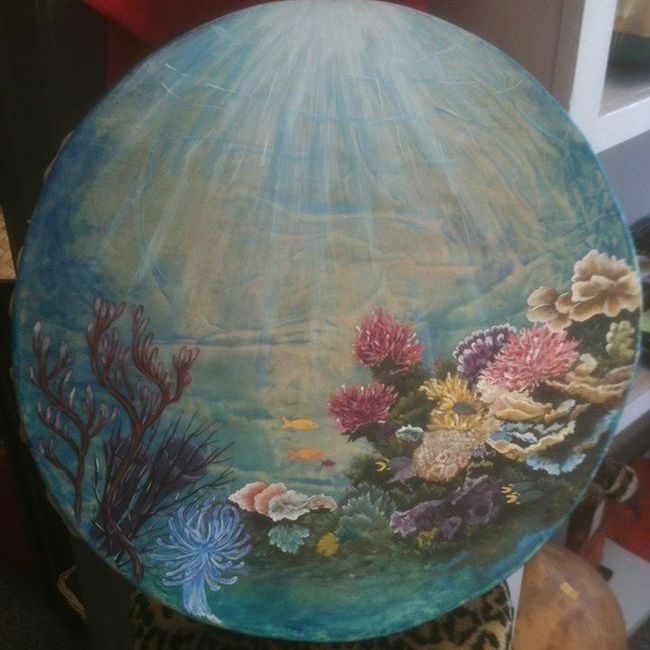 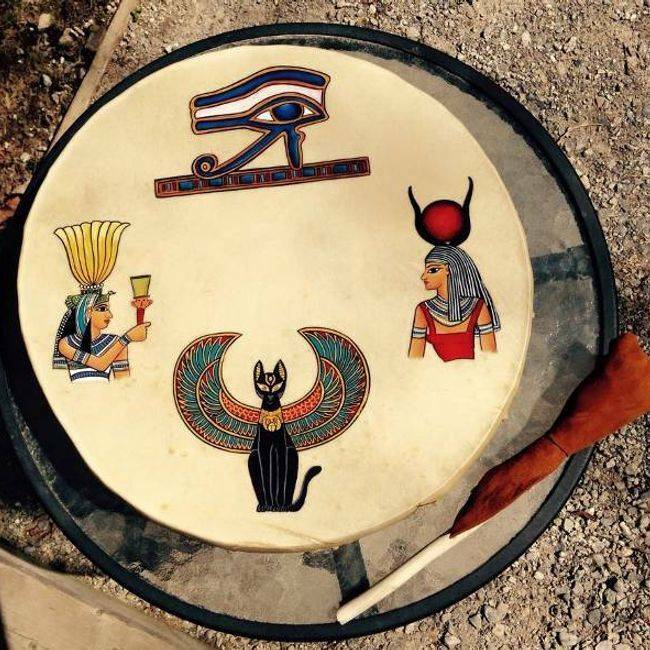 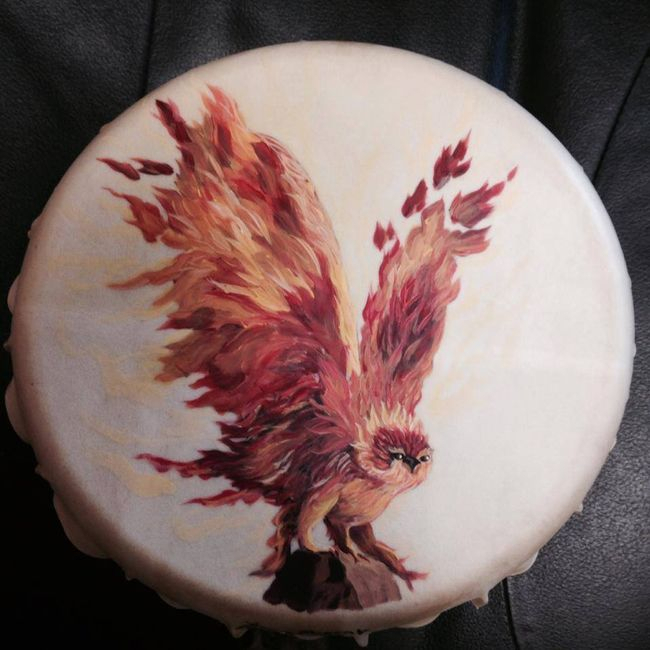 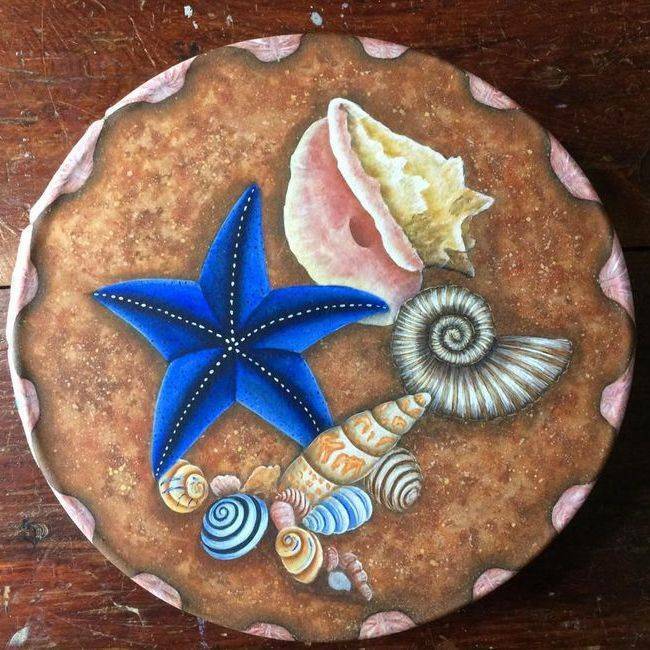 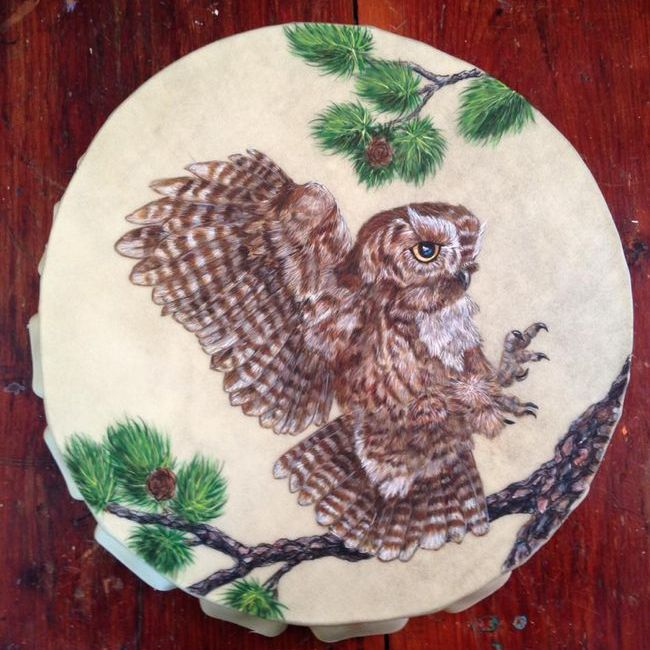 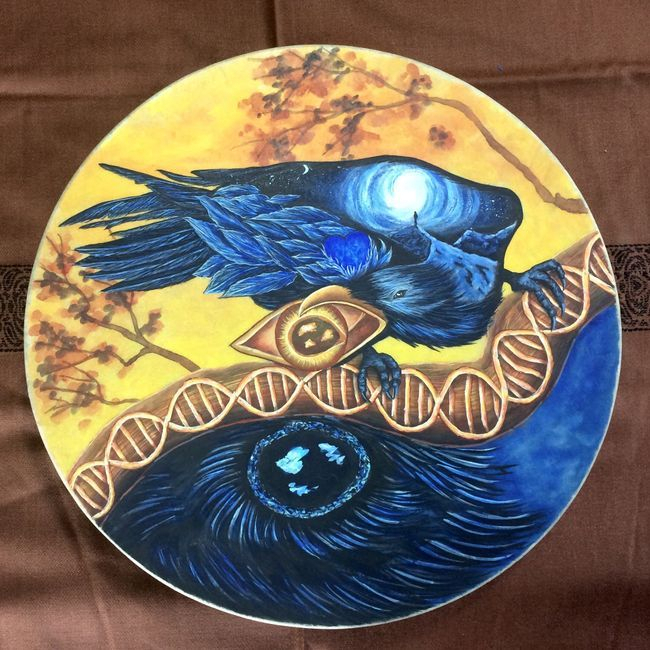 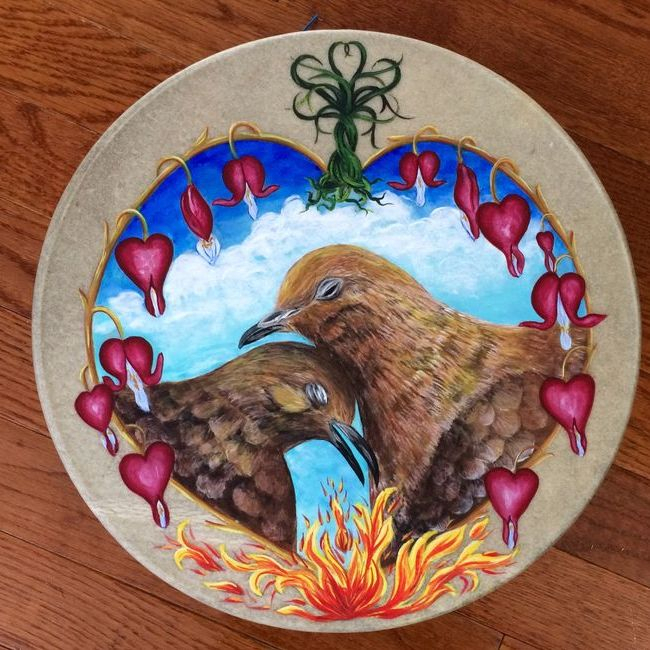 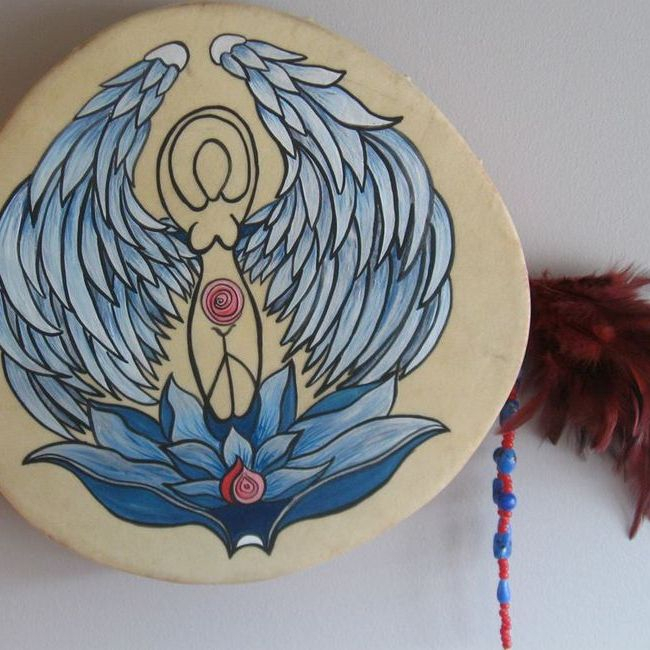 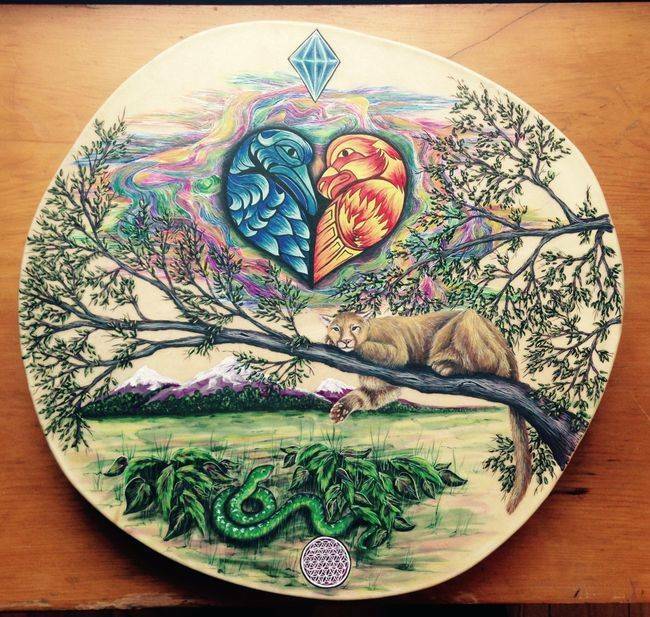 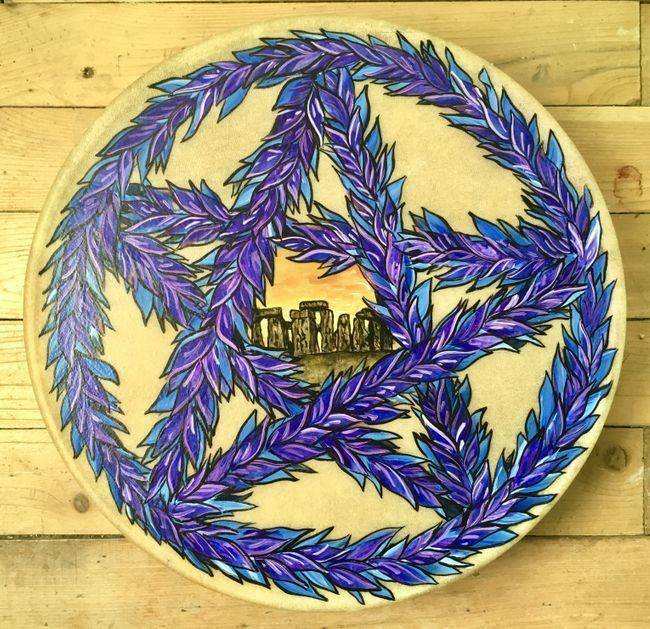 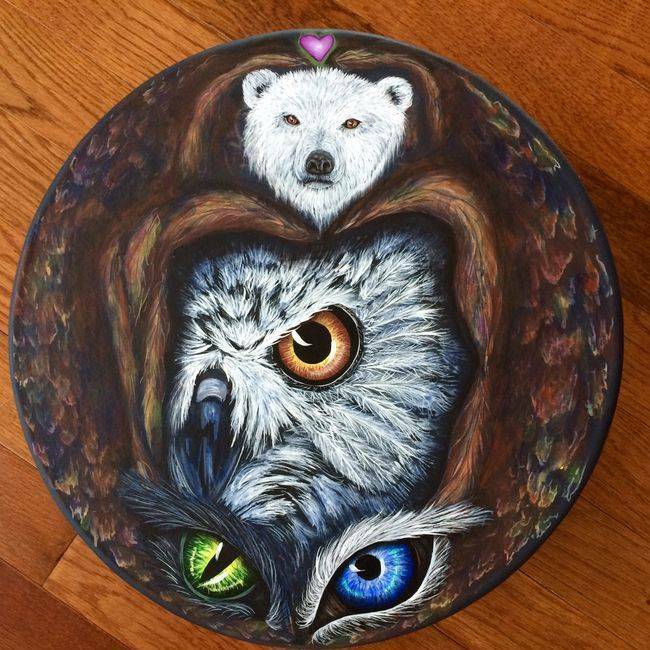 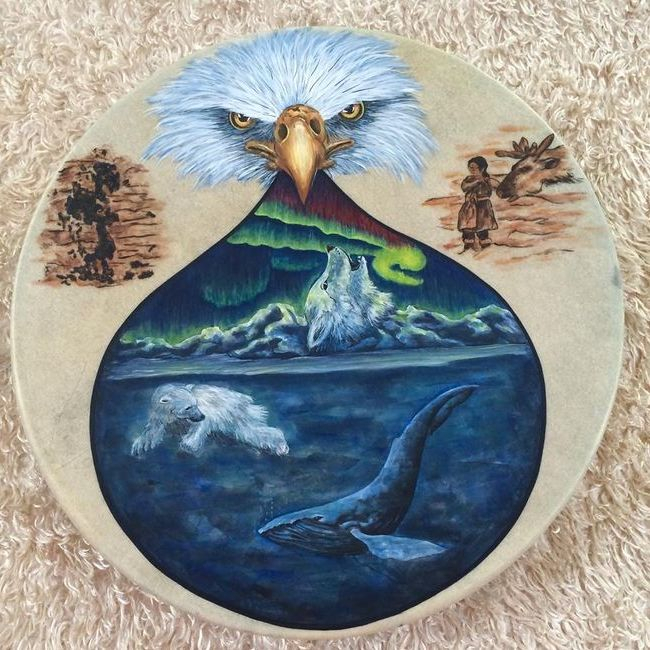 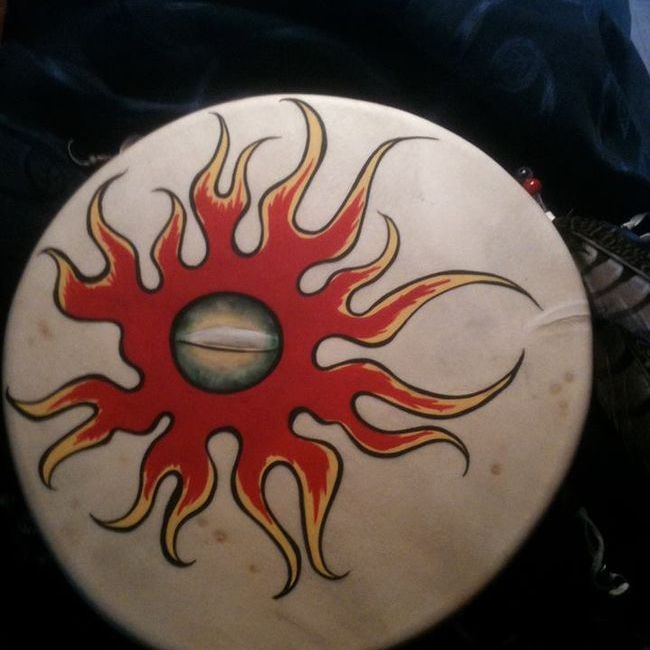 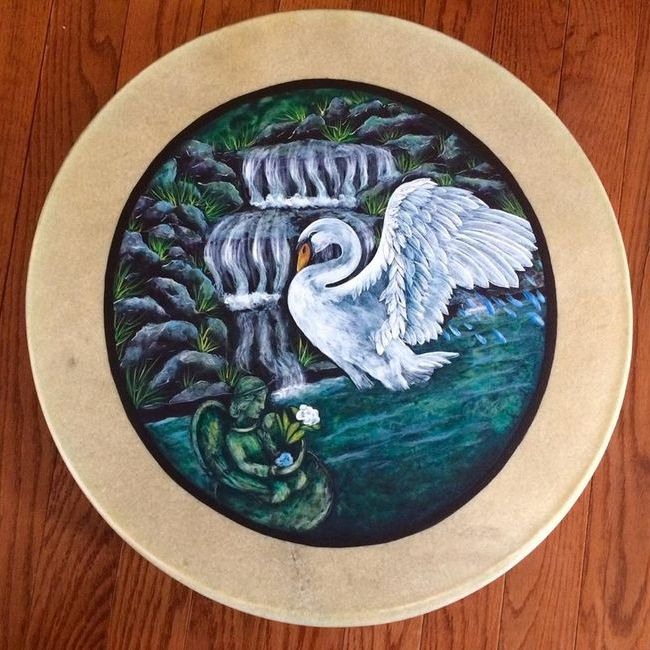 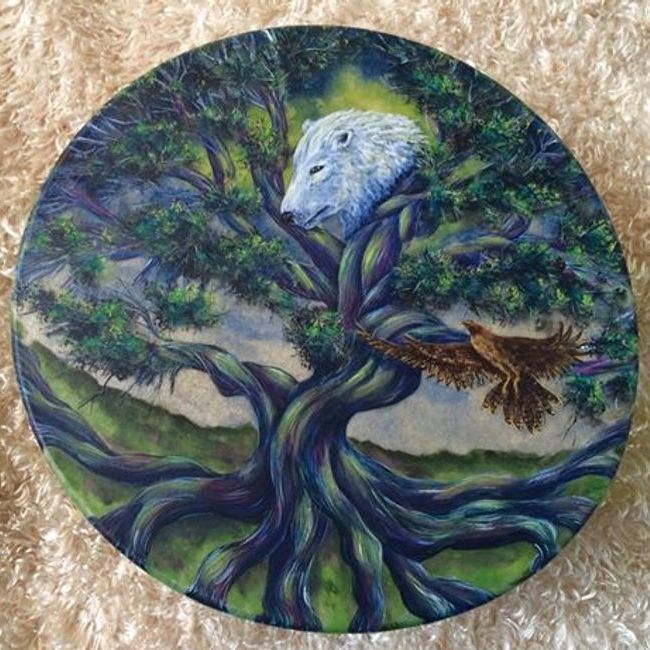 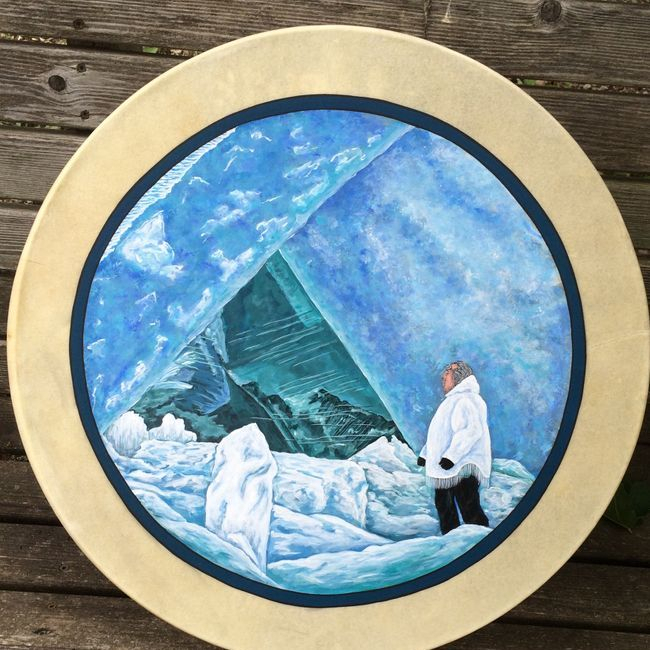 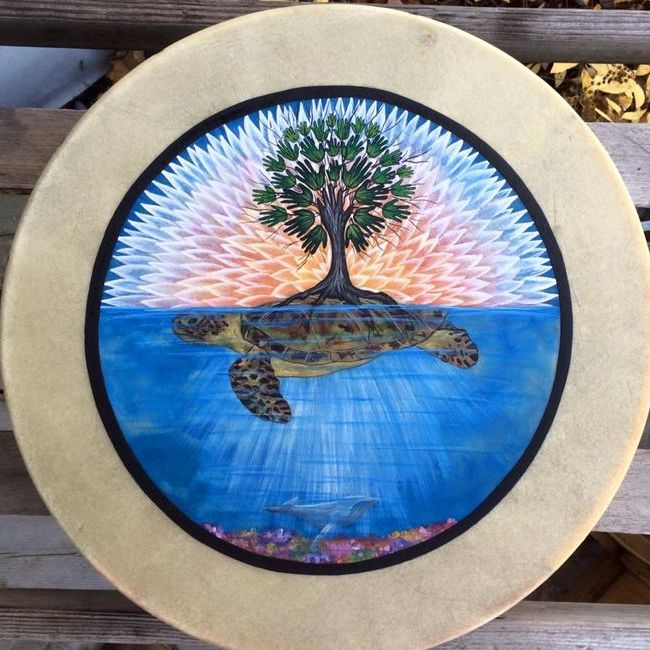 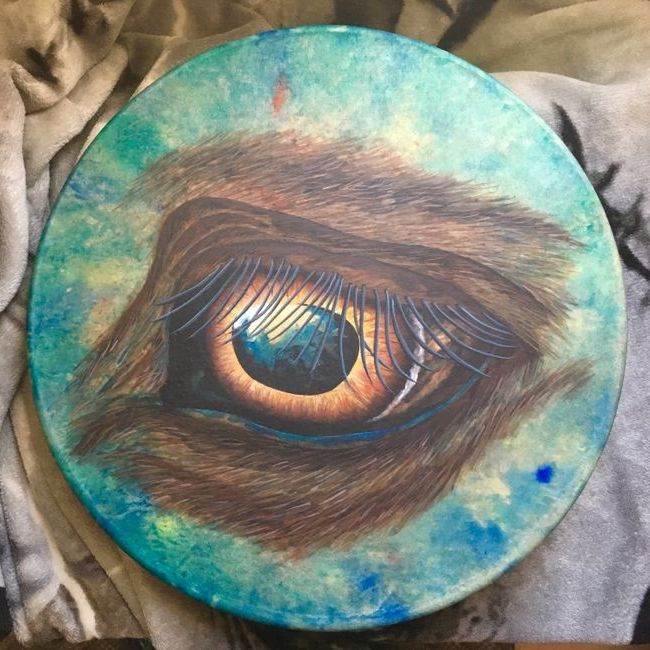 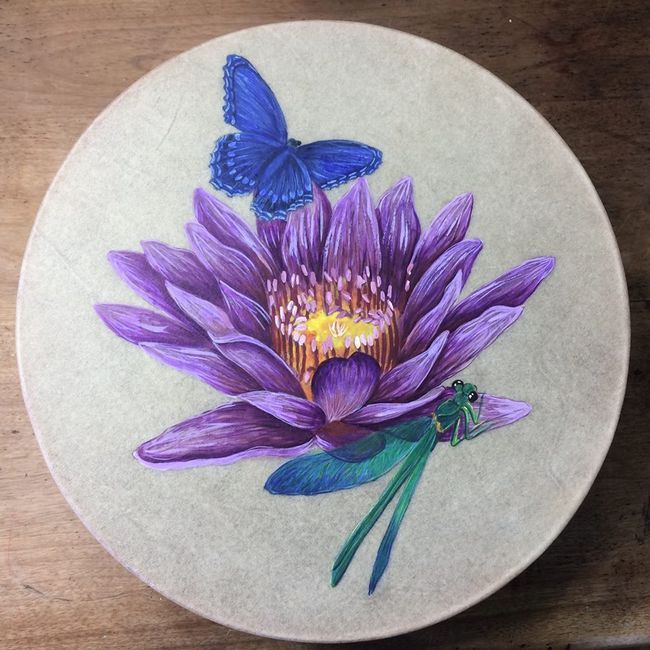 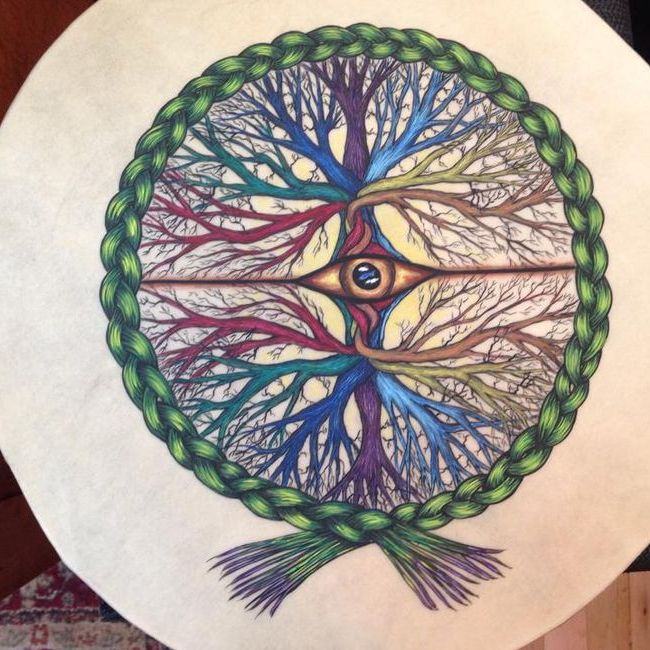 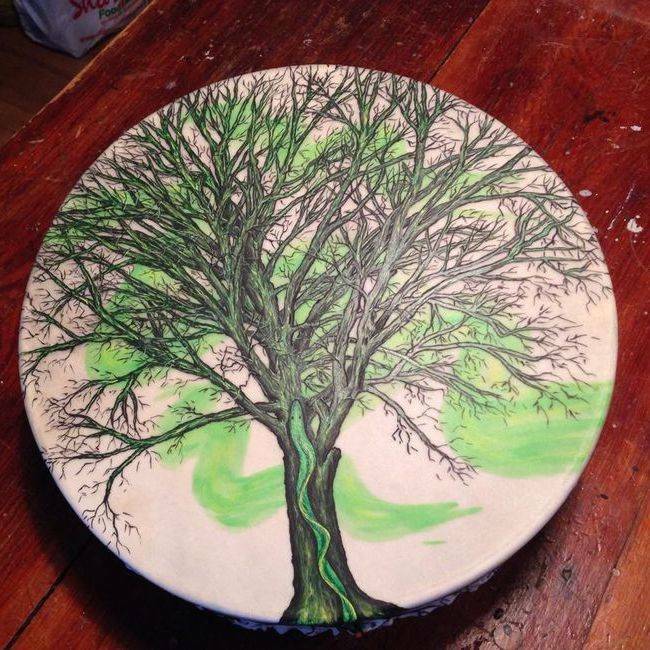 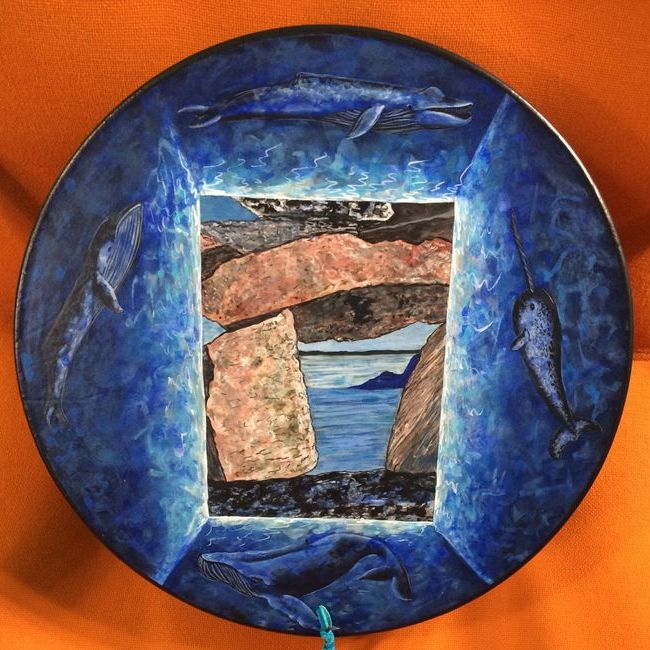 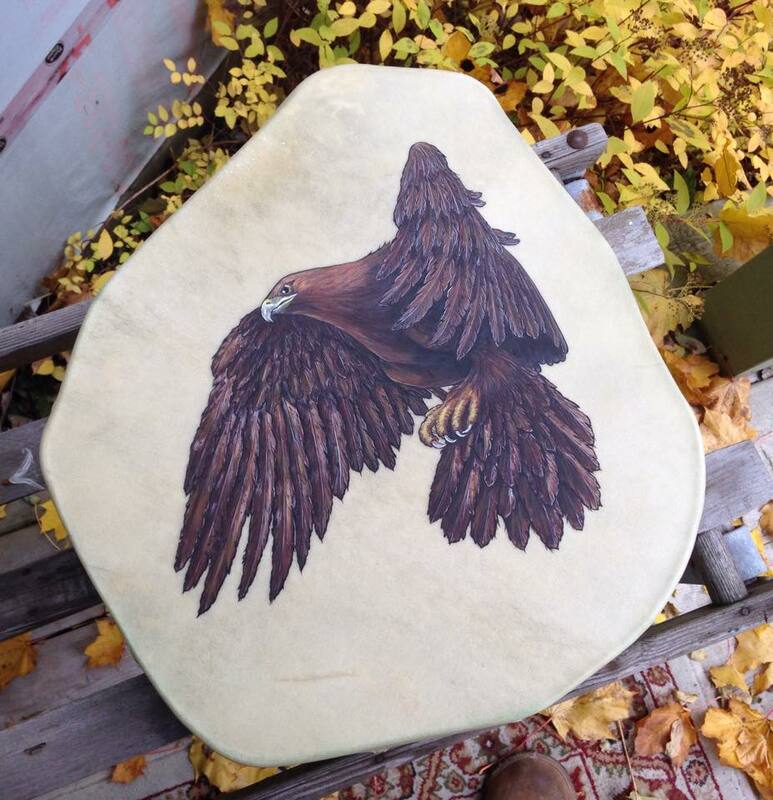 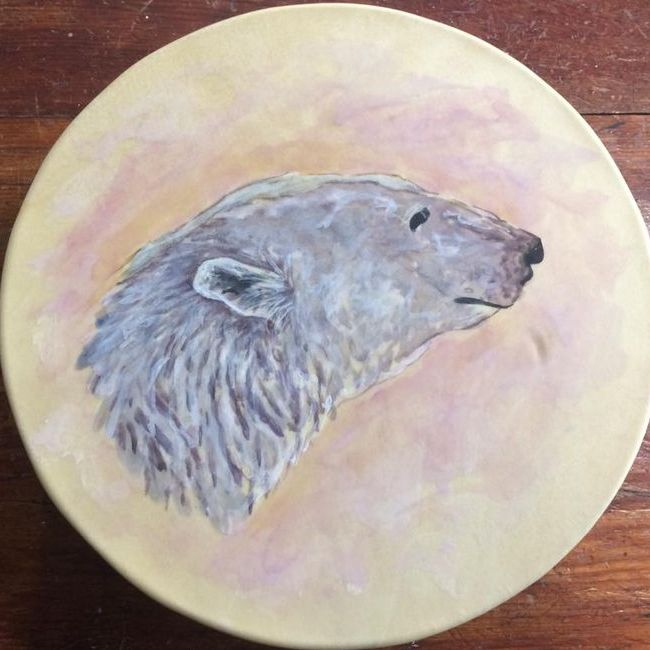 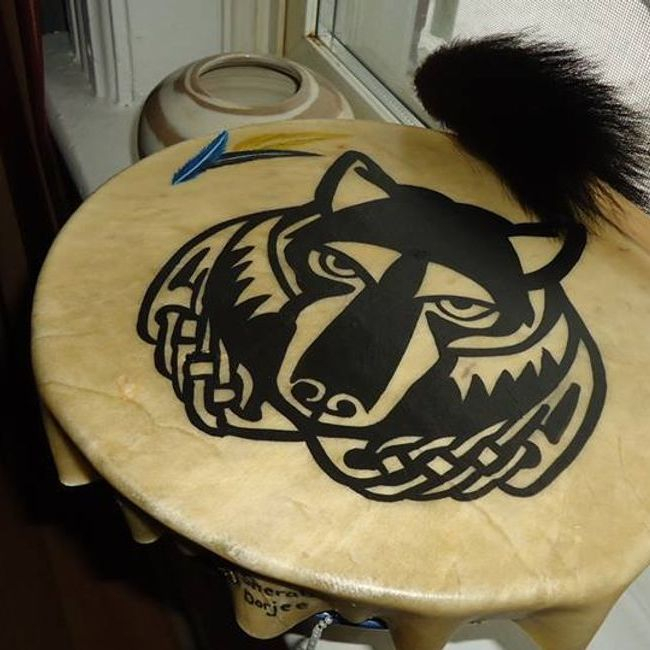 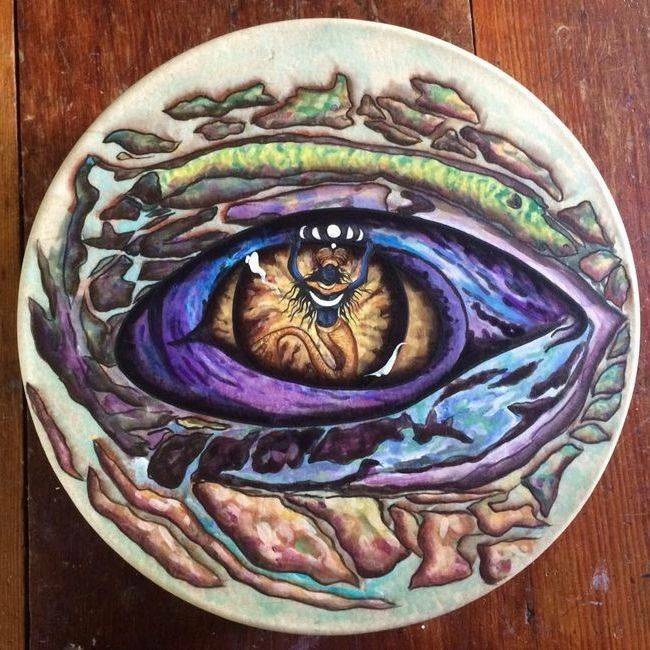 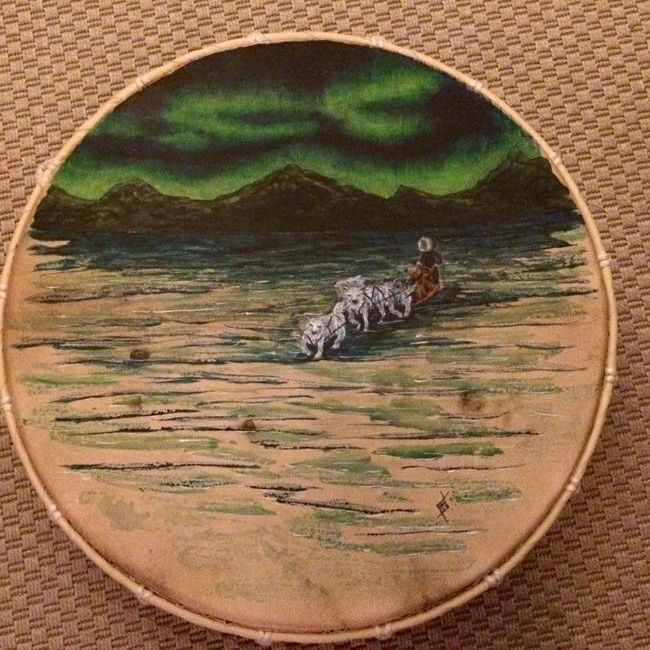 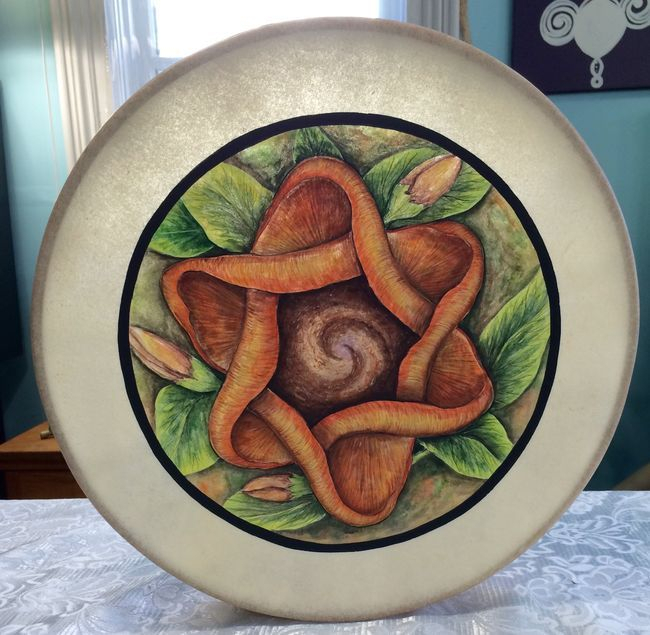 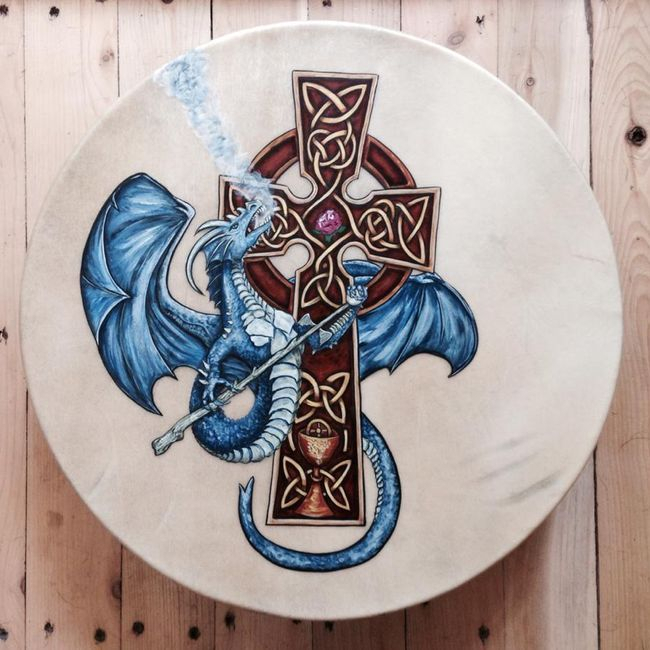 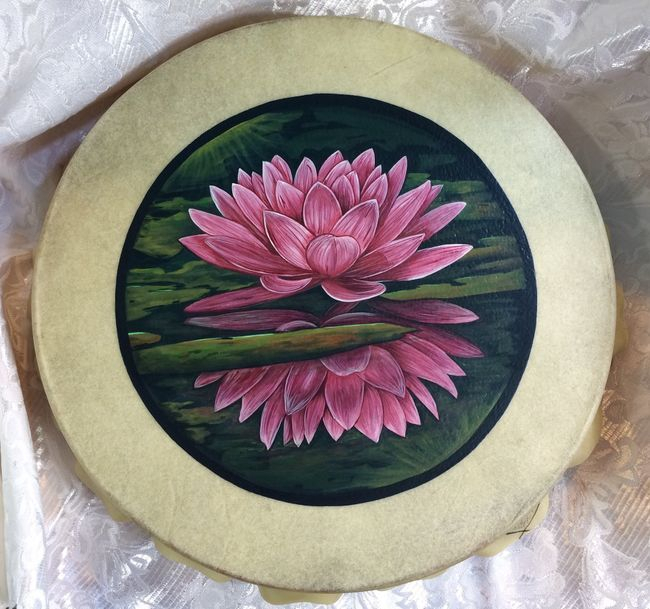 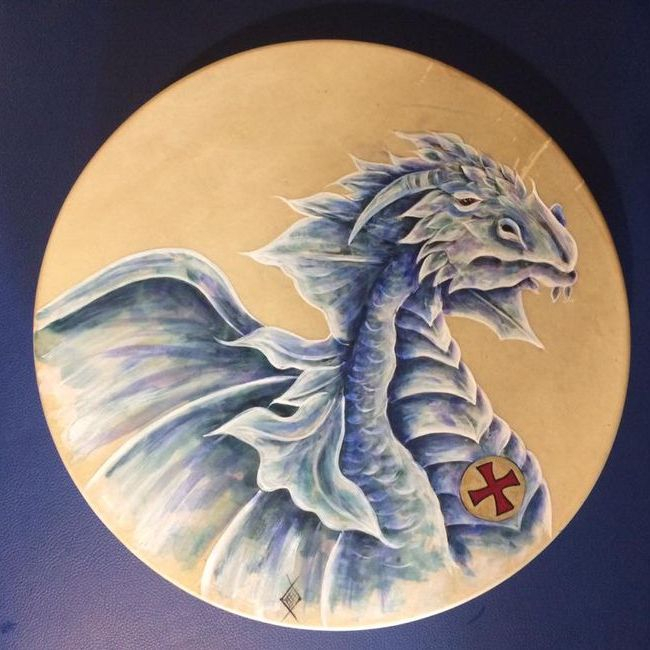 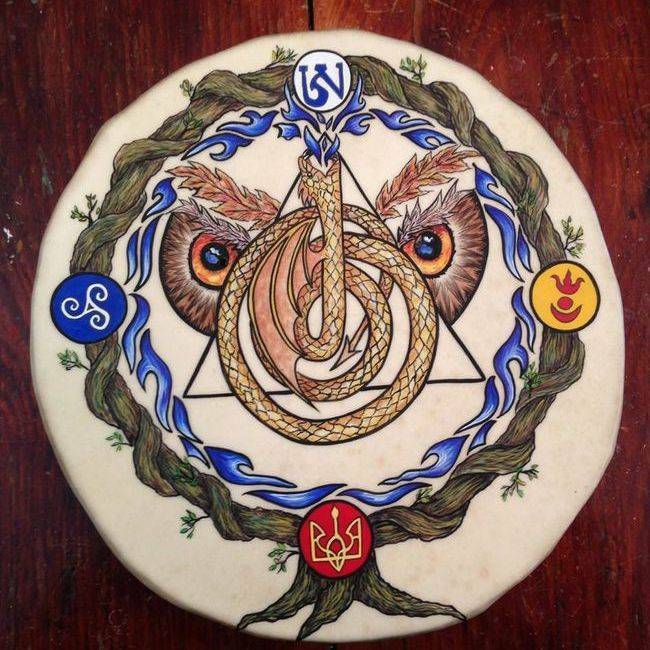 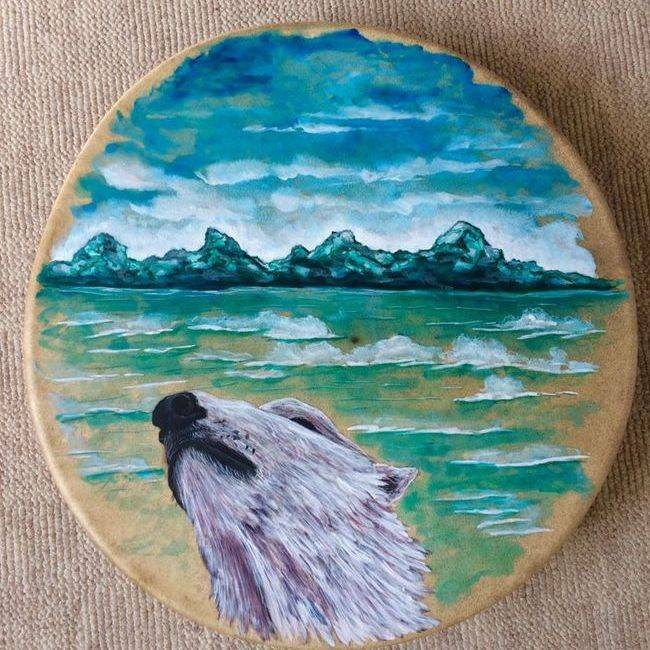 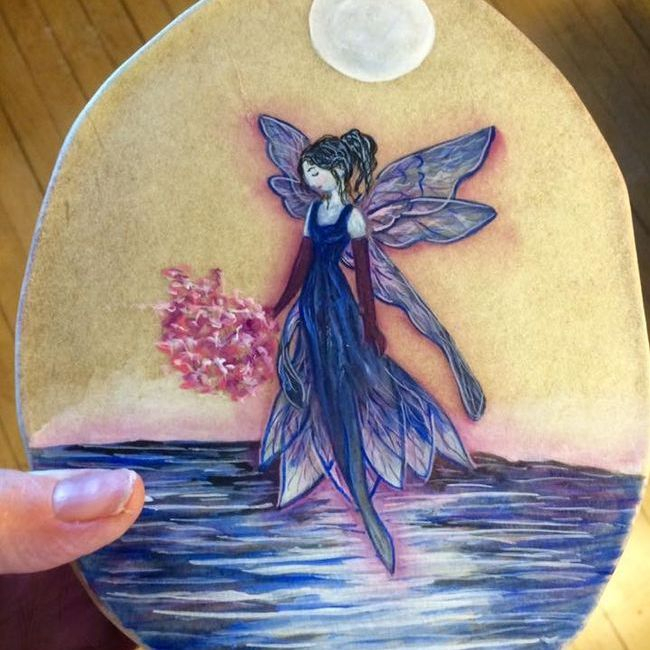 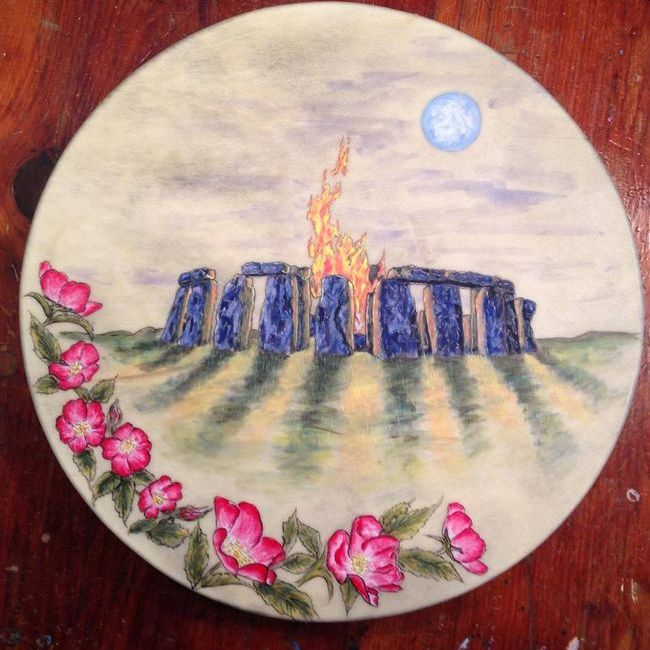 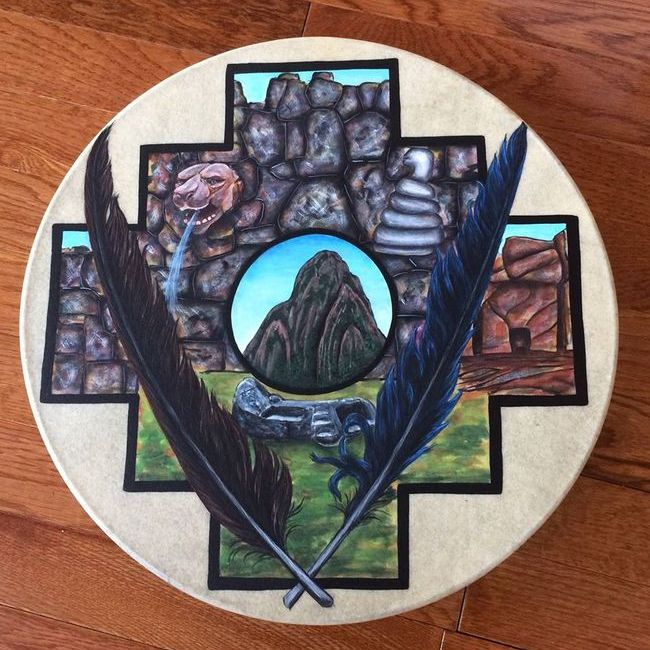 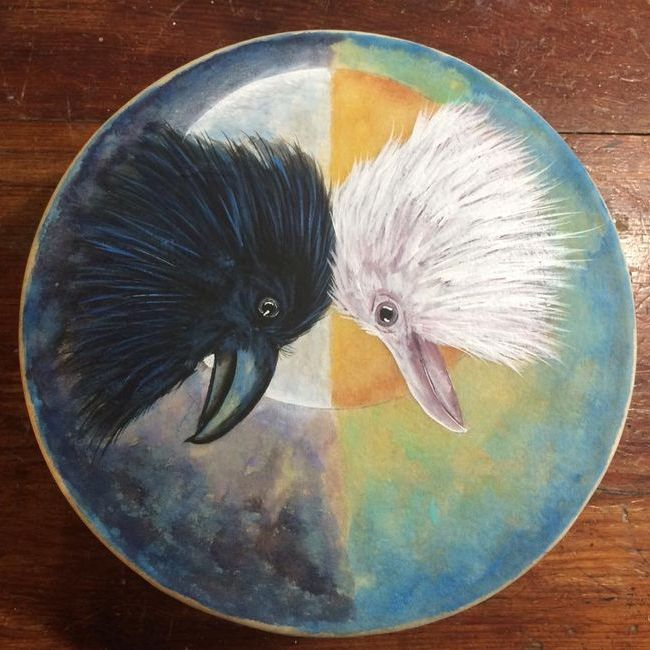 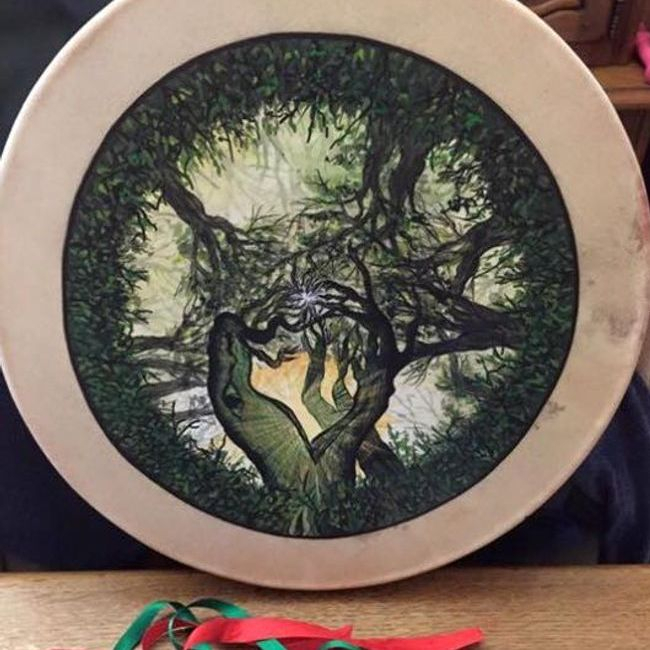 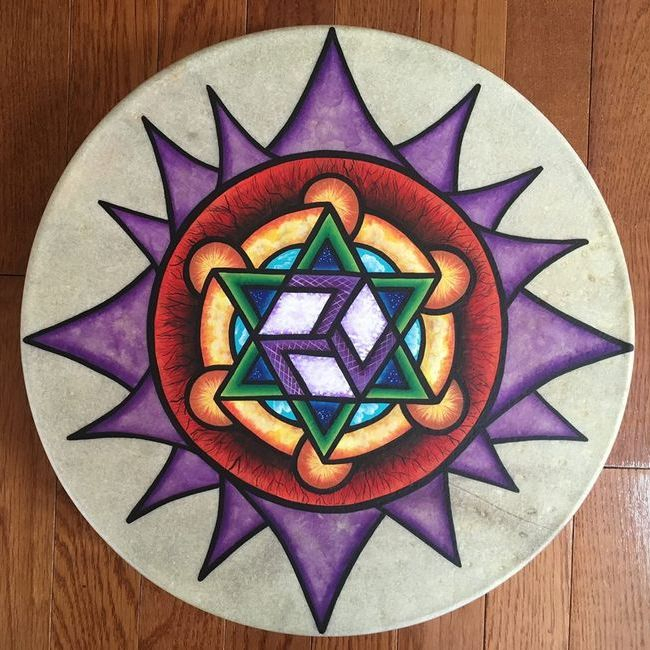 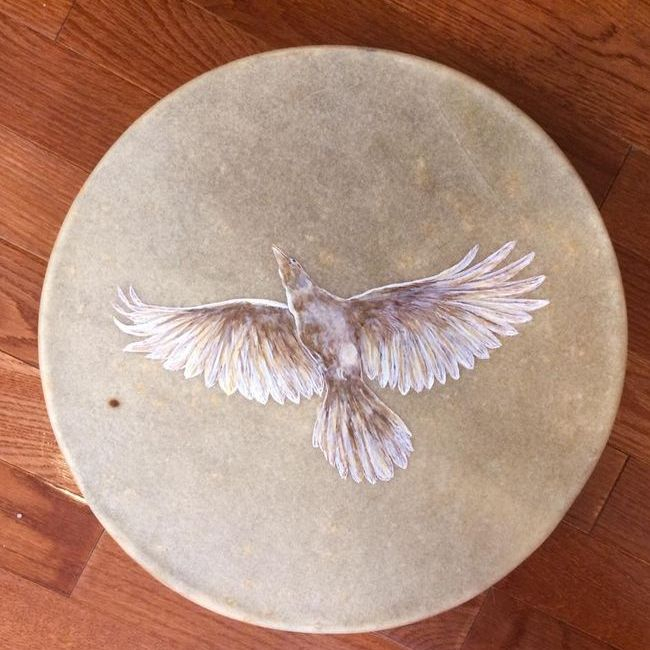 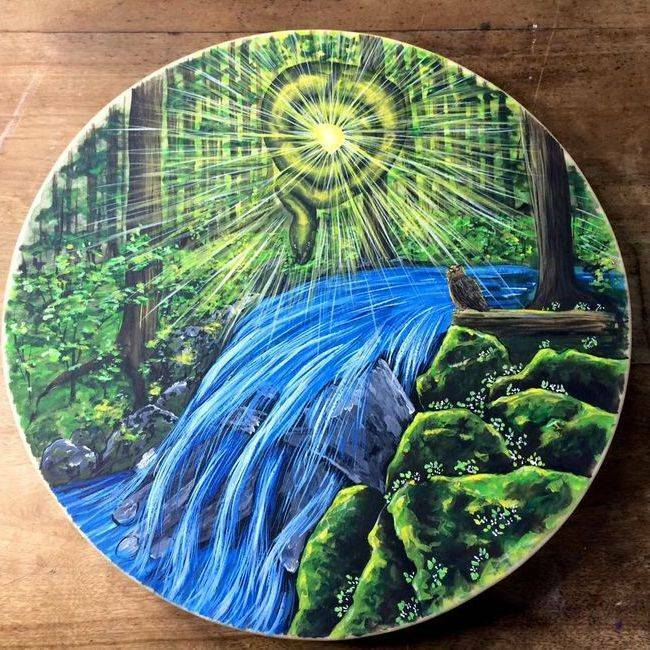 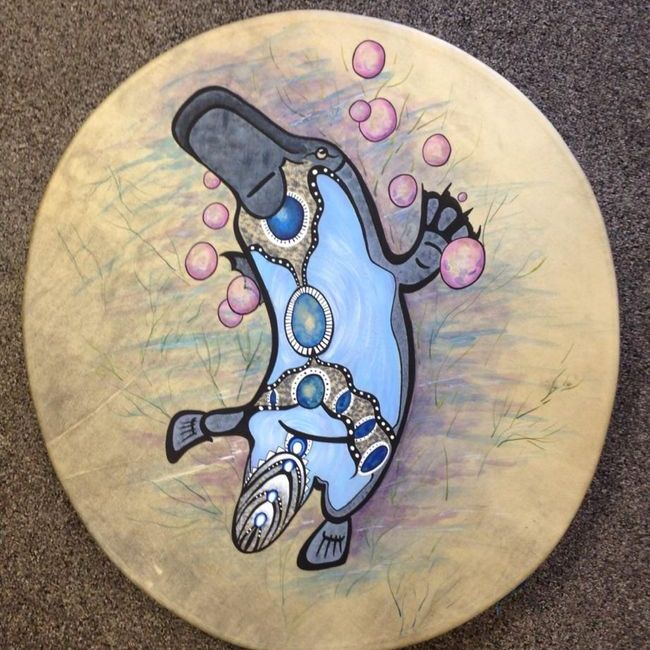 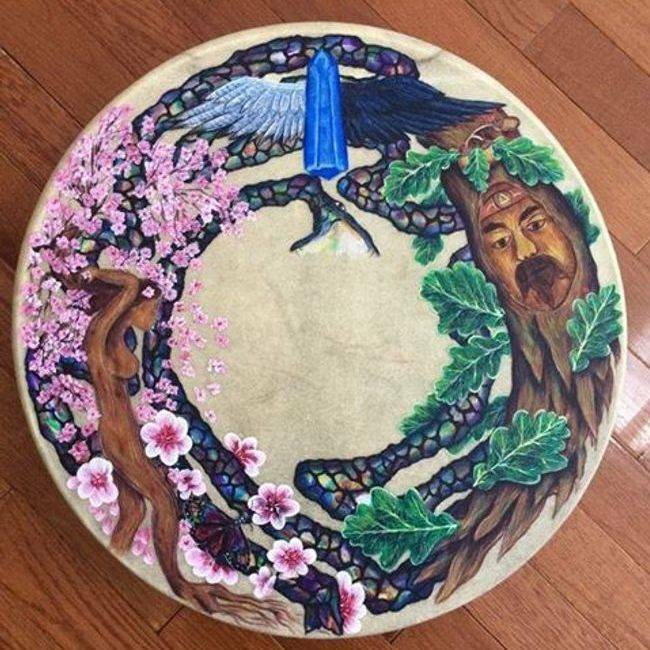 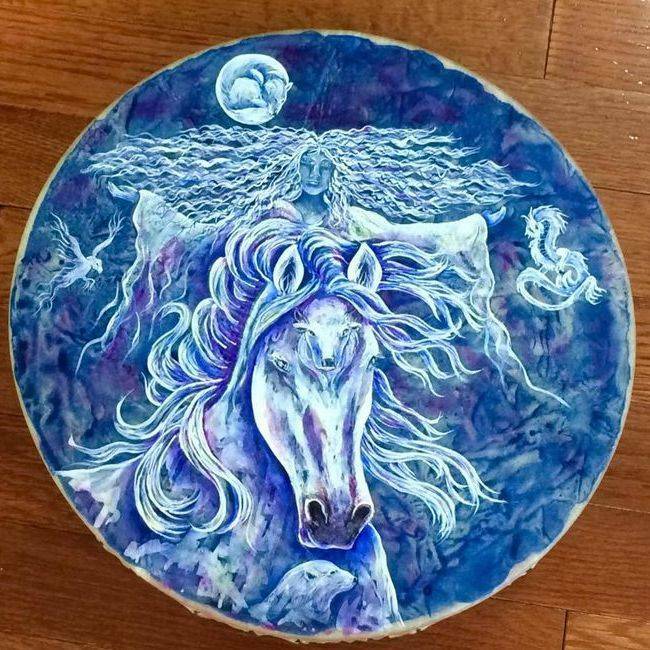 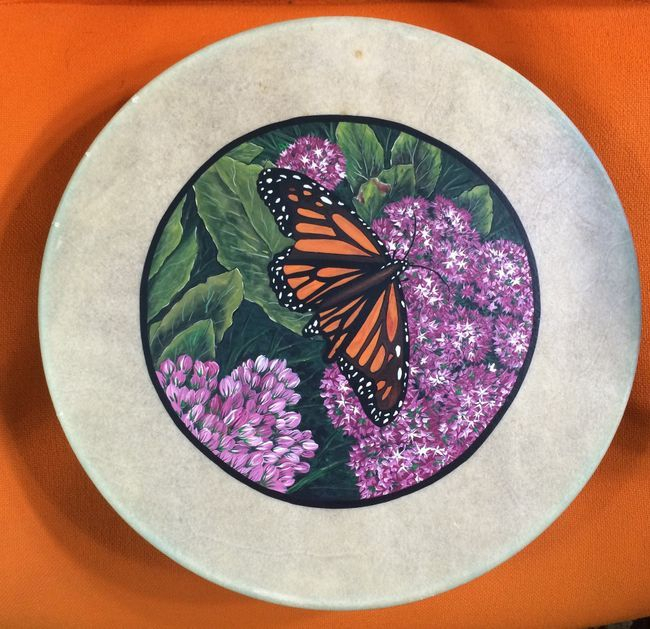 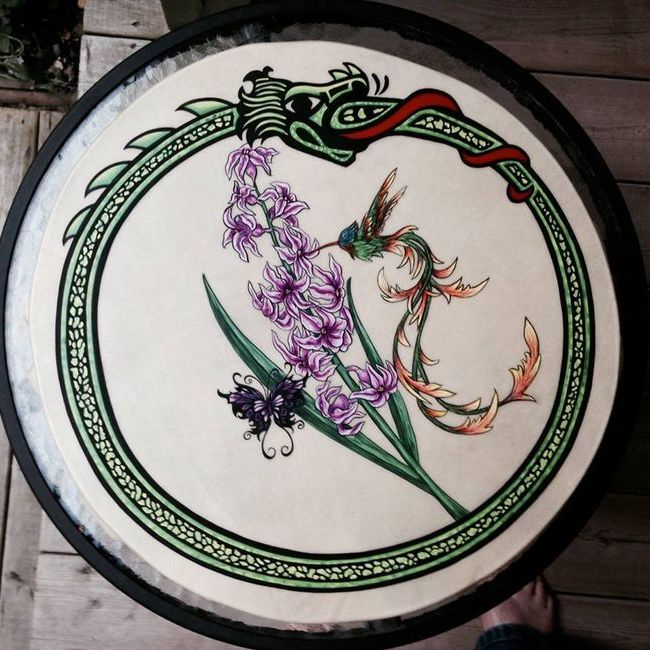 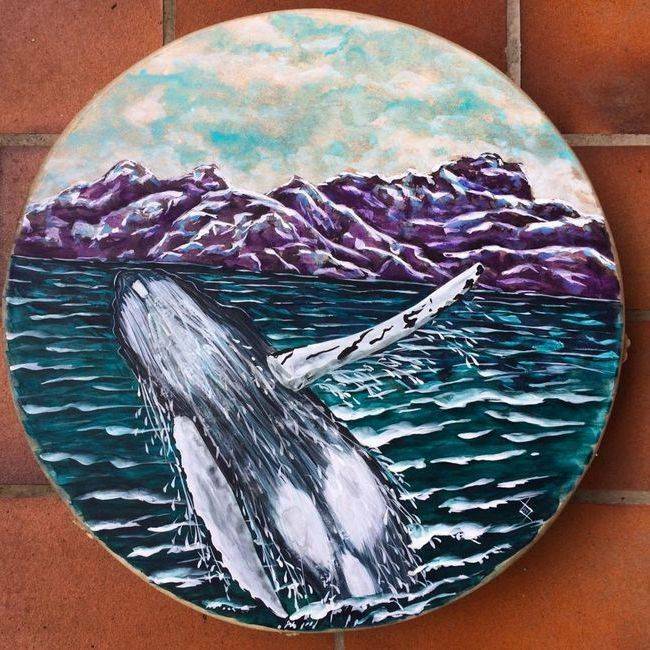 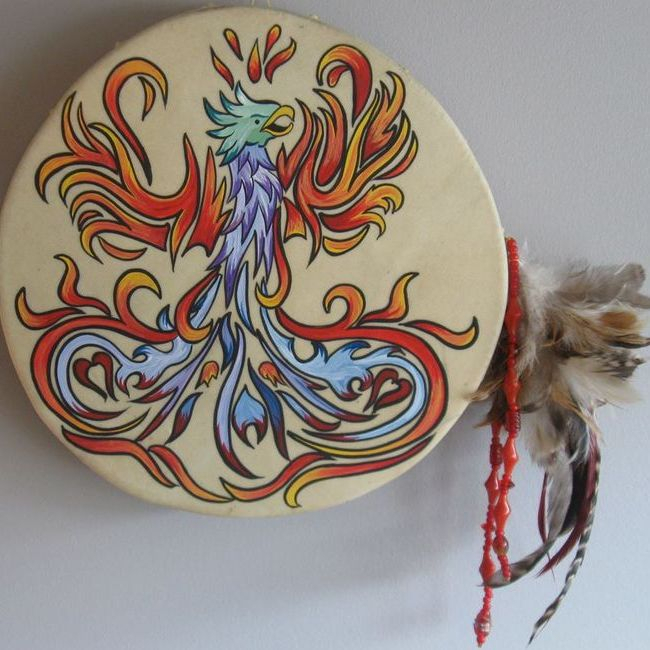 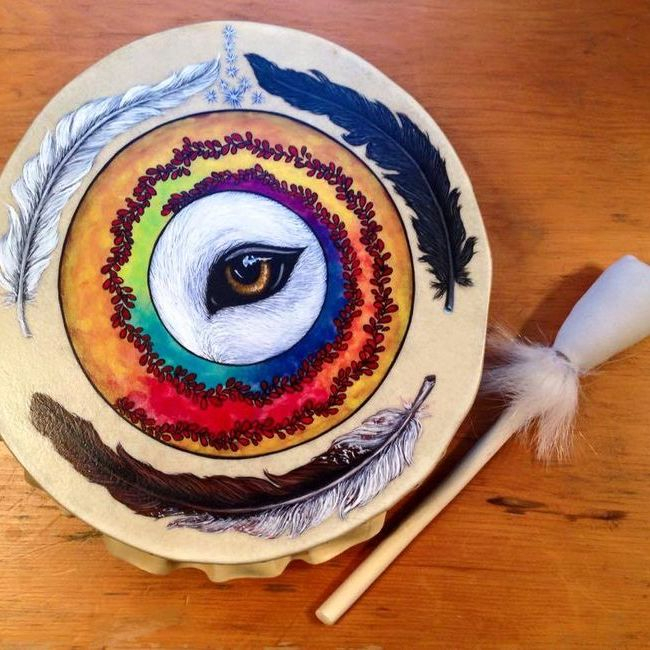 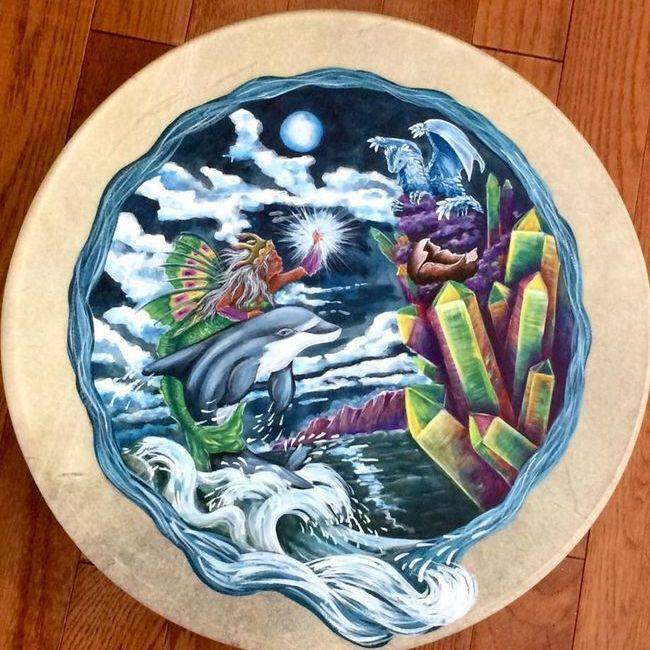 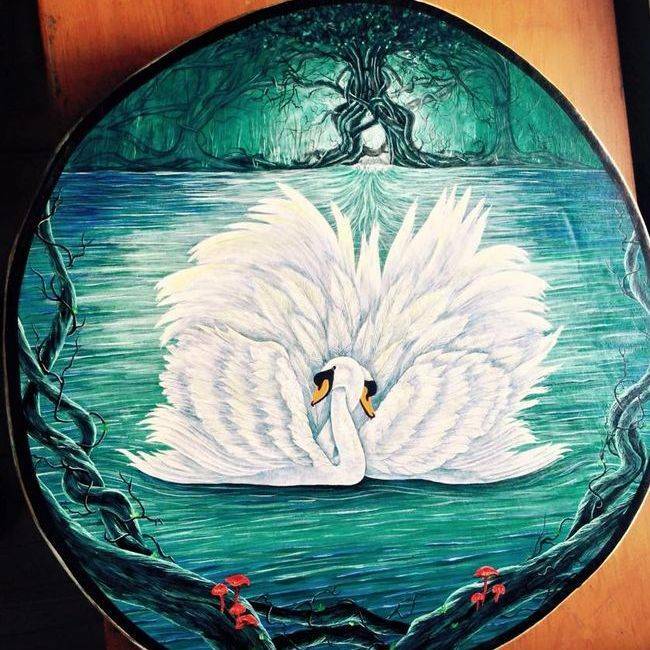 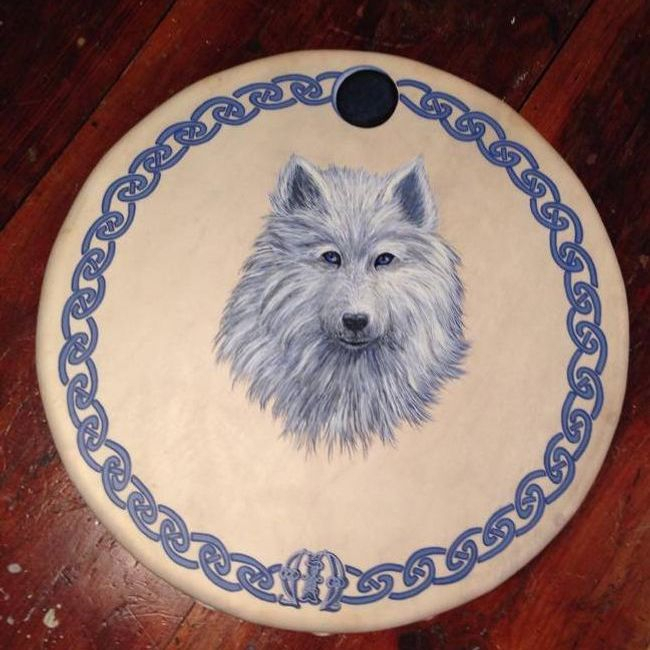 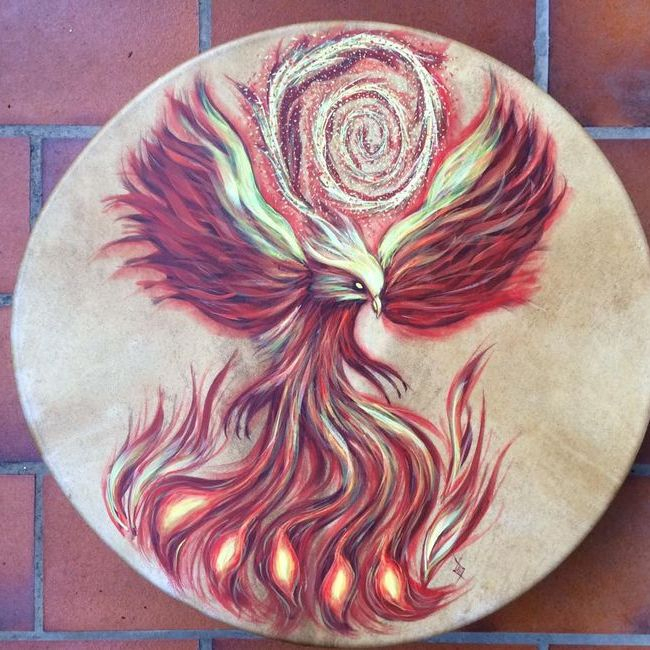 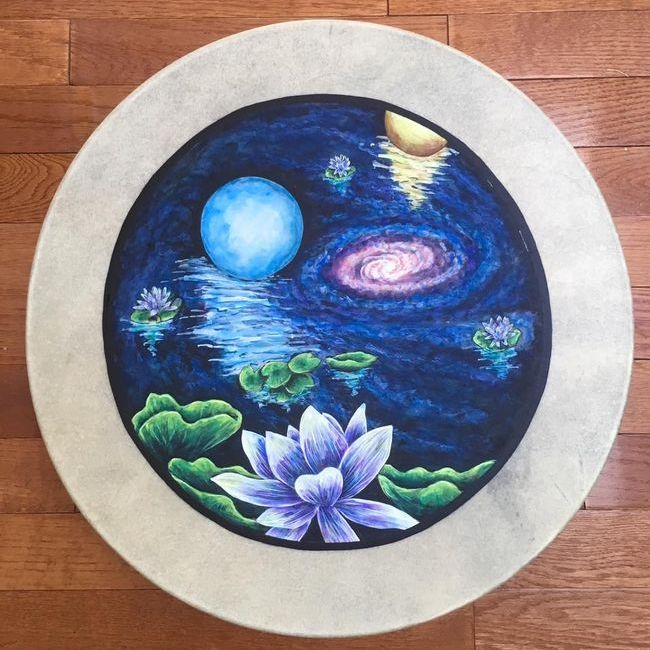 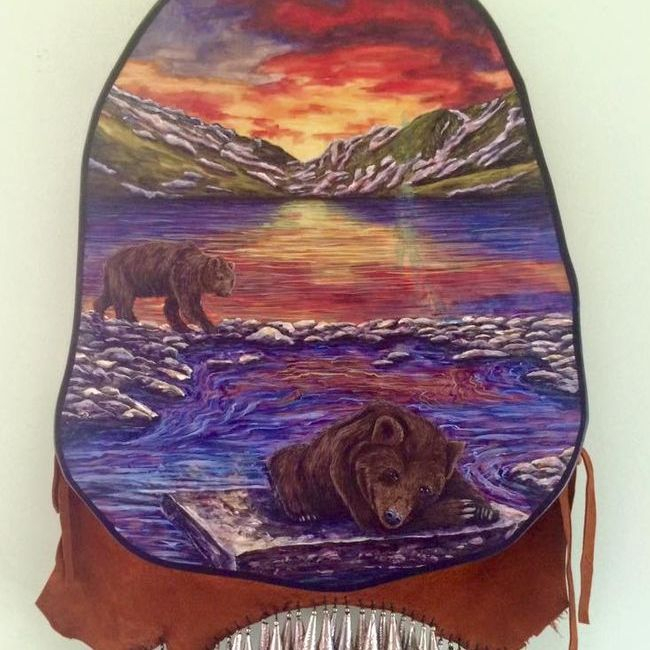 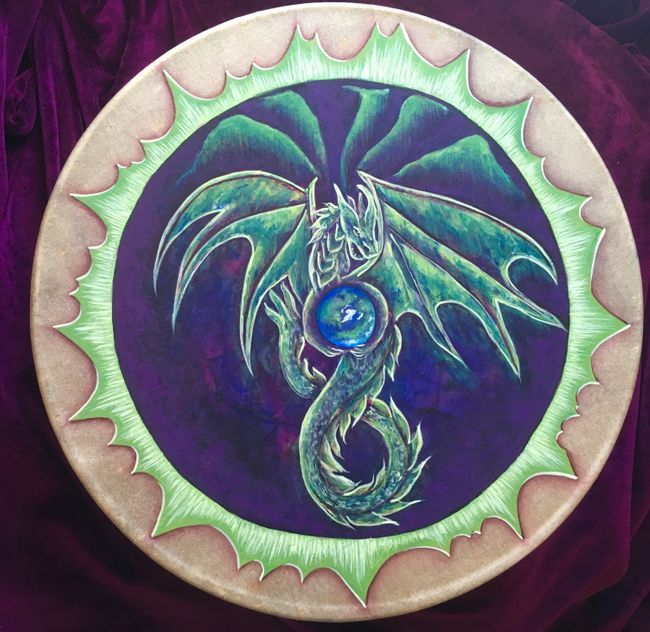 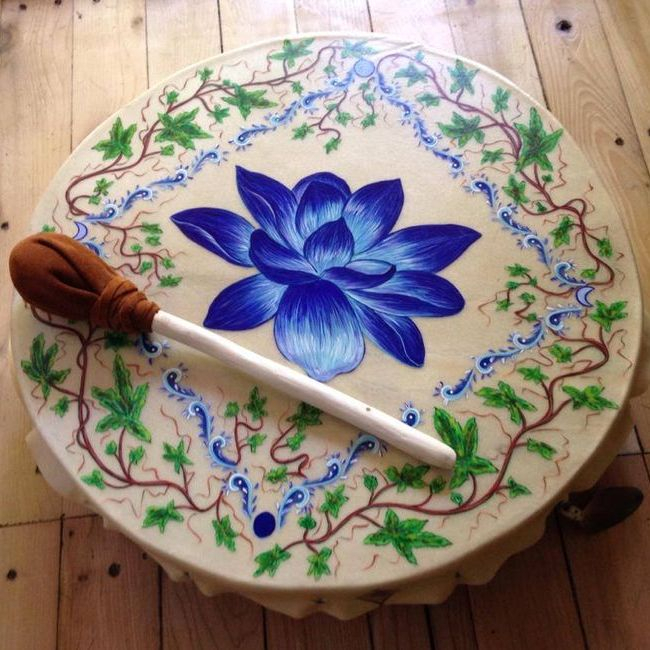 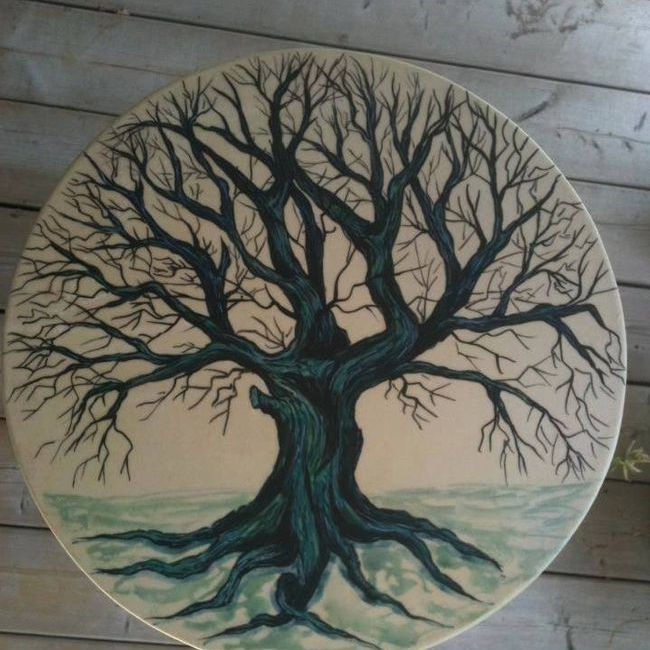 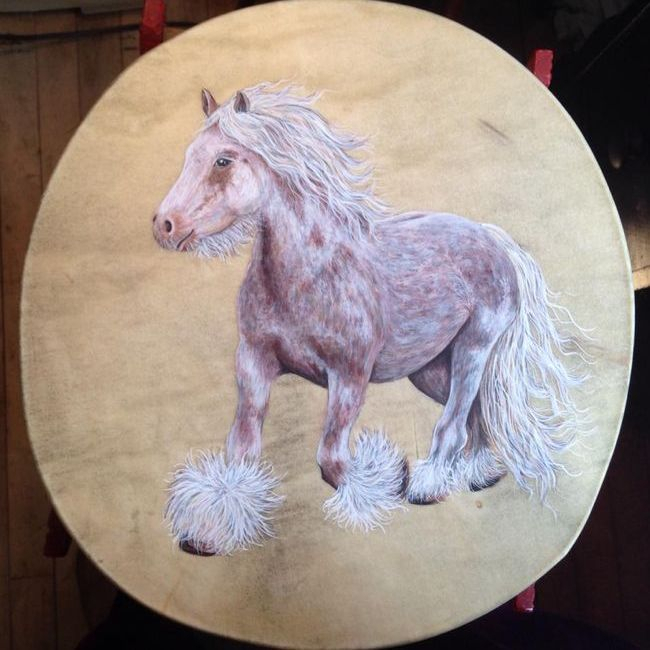 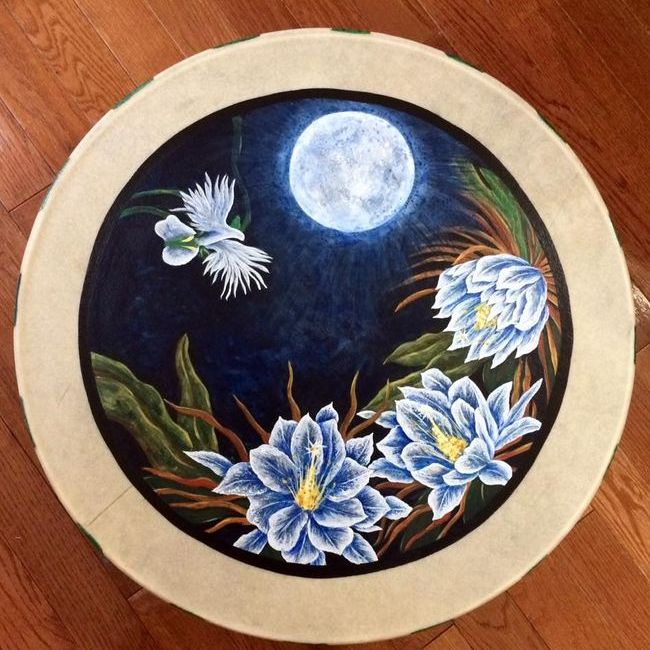 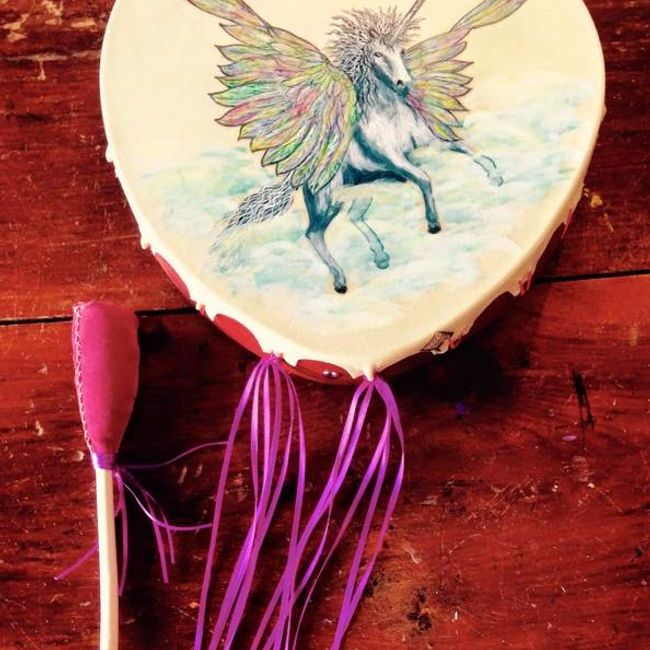 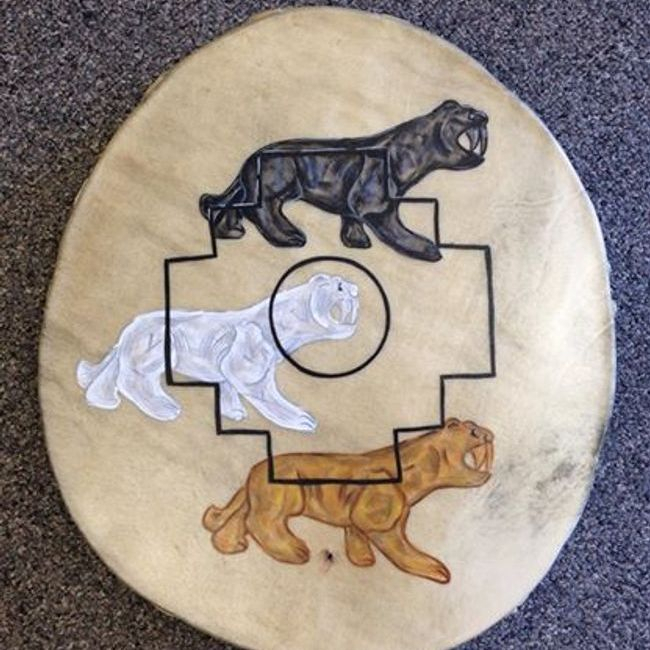 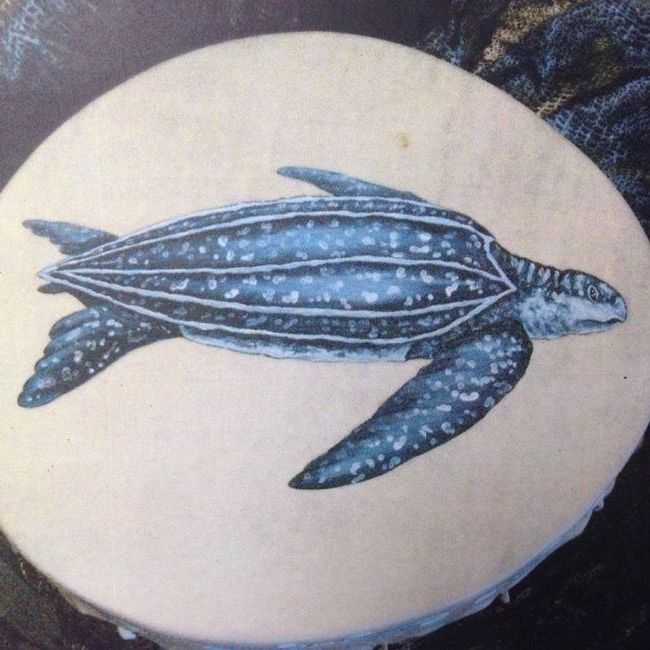 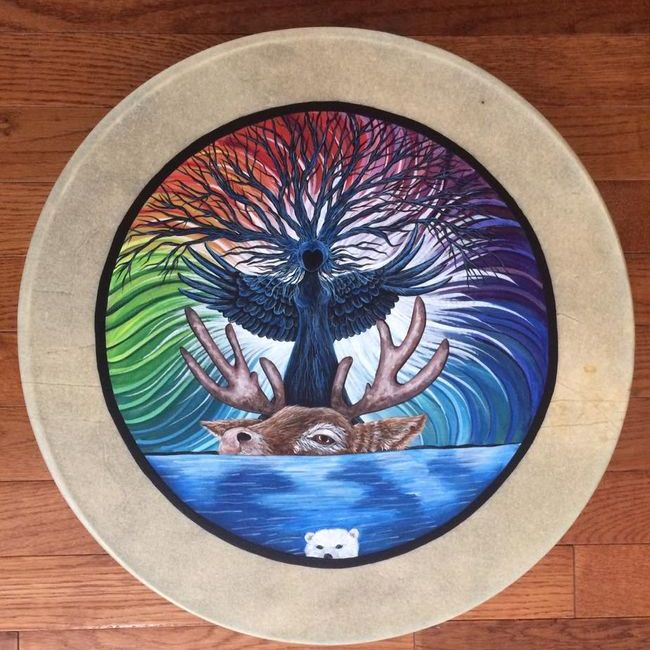 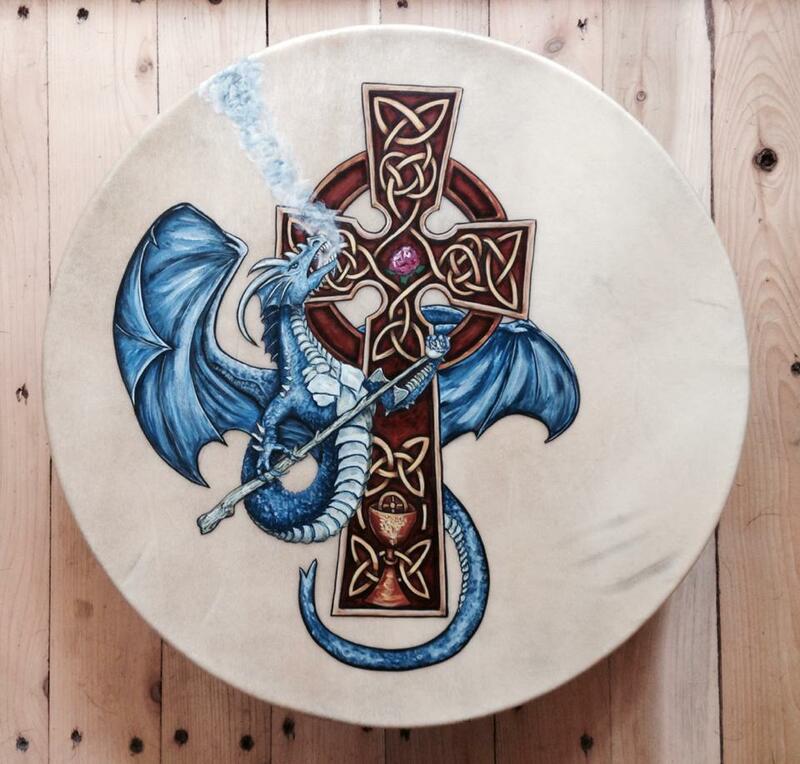 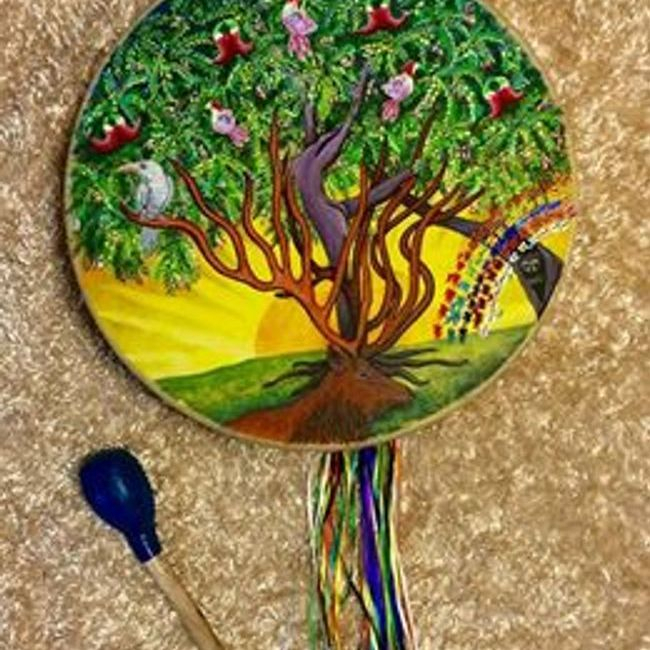 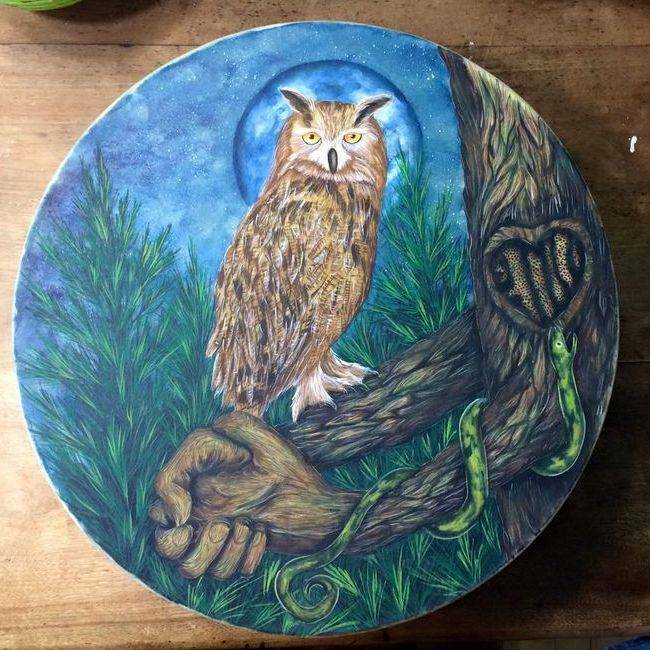 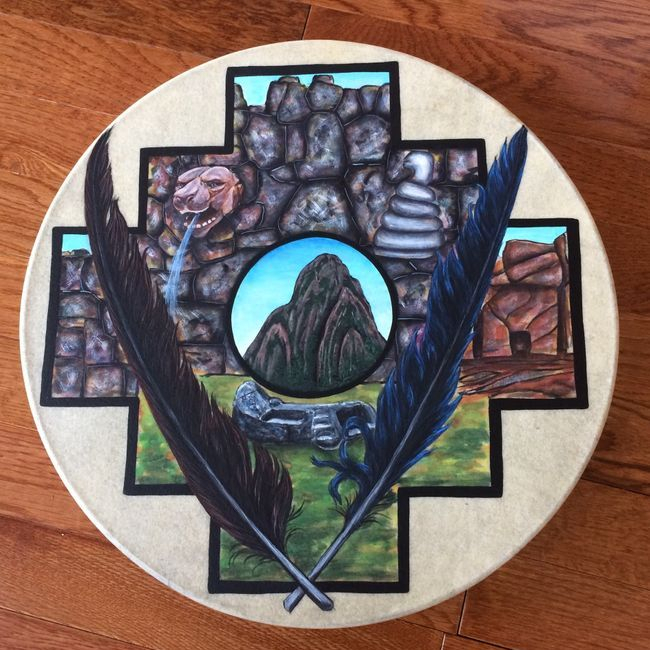 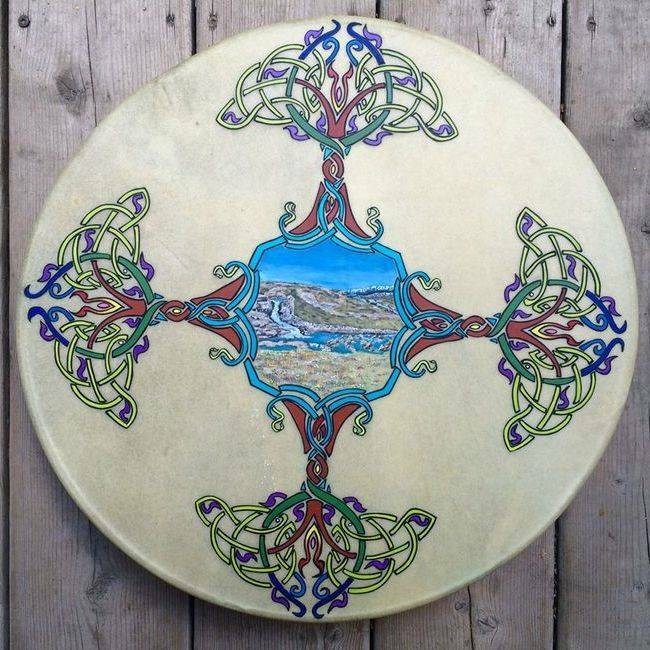 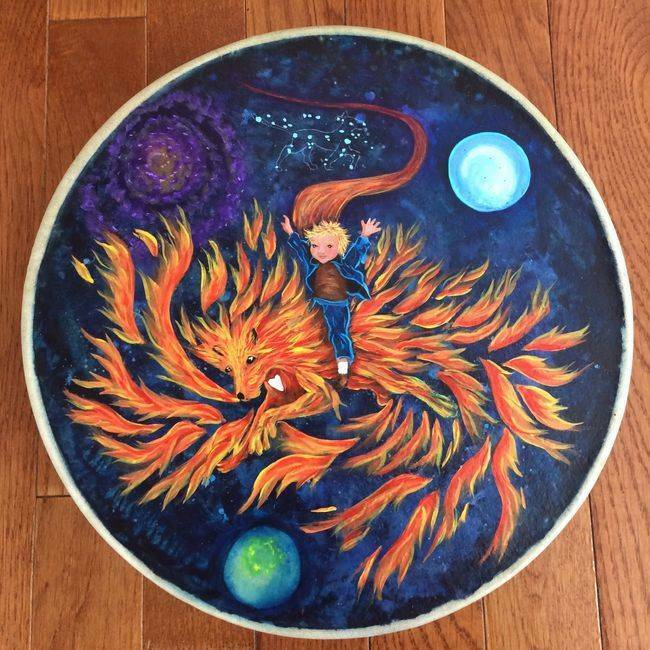 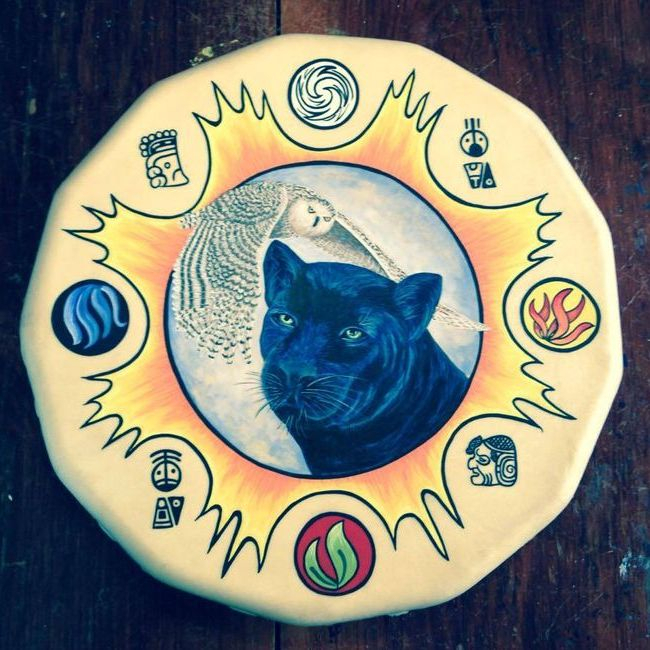 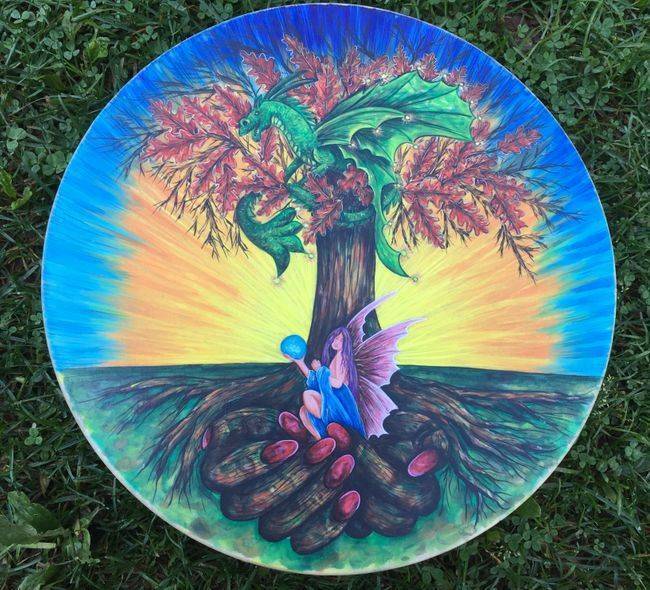 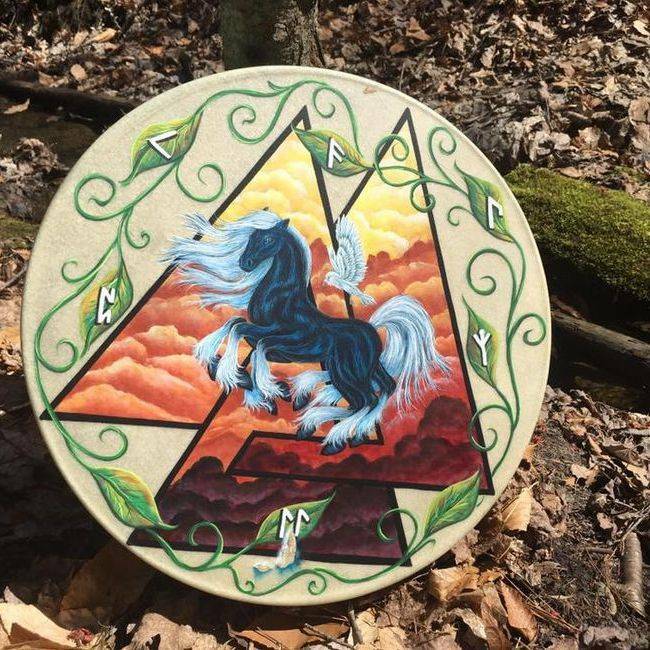 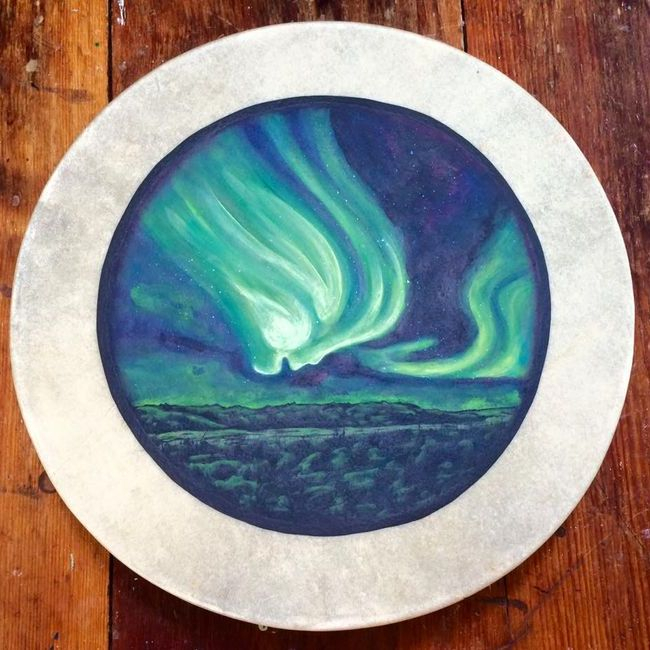 Hand crafted drum creations with spirituality as the theme is the foundation of Gayle's studio of Sacred Wisdom Drums. 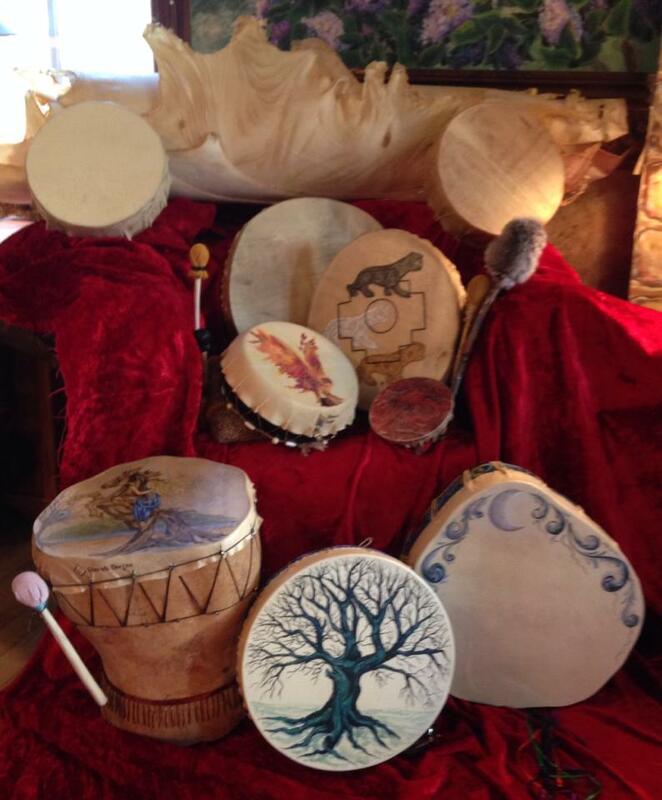 Each drum has the thundering voice of the big Ice of the high Arctic. 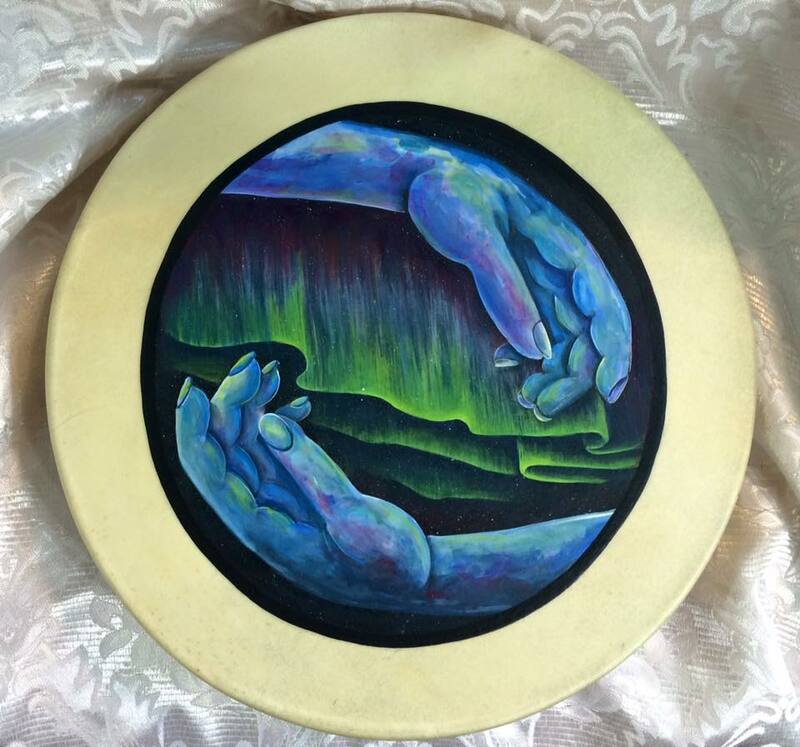 I have set my roots down across Canada over the years from Northumberland County, to living in Calgary, Yellowknife, NWT and the Comox Valley Vancouver Island. 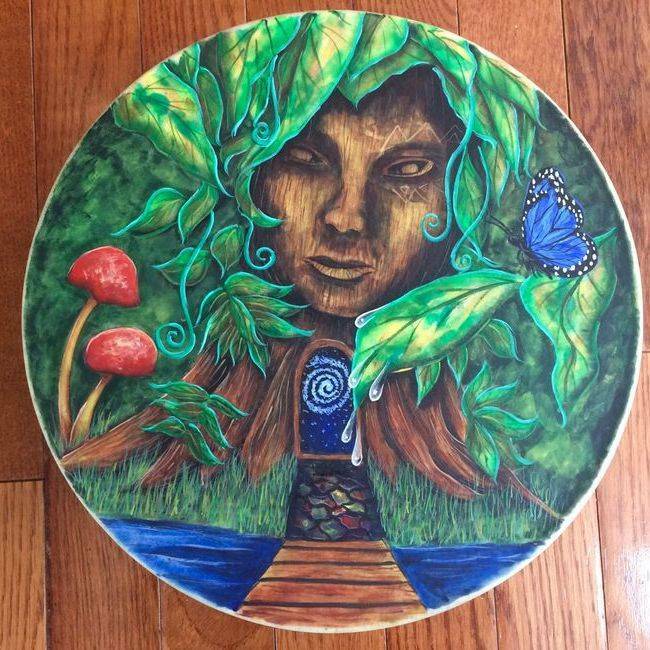 I have searched for the meaning of life on top the mountain temples of Peru and the Jungles of the Amazon basin. 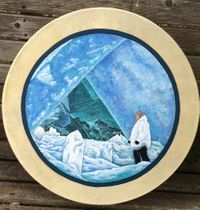 When I climbed the mountain in the Sacred Valley at the Arctic Circle Greenland I found my voice. 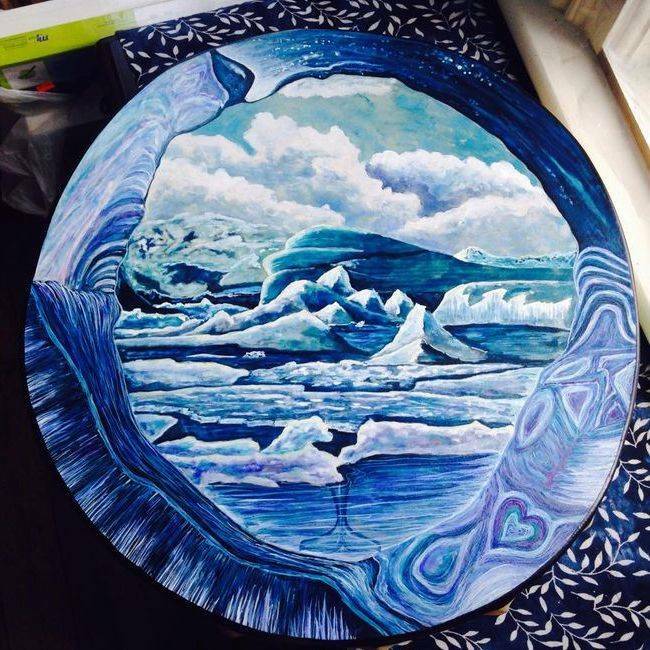 I found my voice in the sound of the Big Ice as it cracked and thundered. 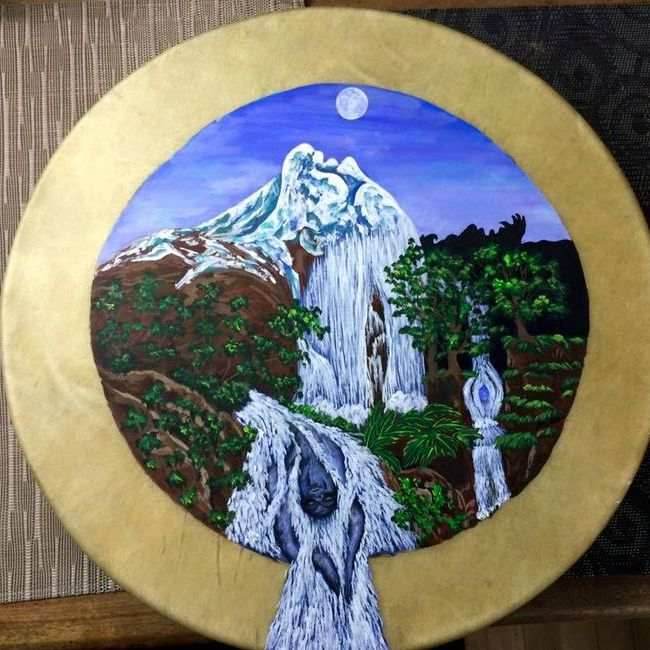 Its sound reverberated off the nearby mountain. 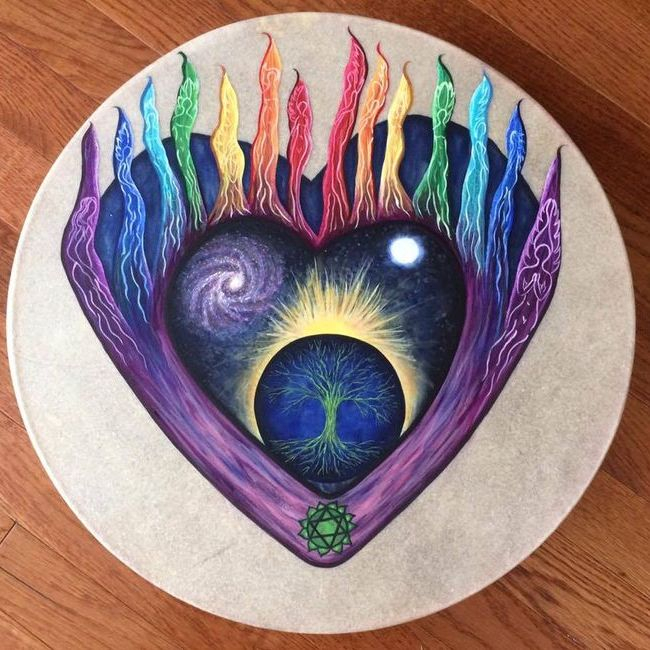 Its sound was the sound of my heartbeat, the sound of my creations, the sound of my wisdom drums. 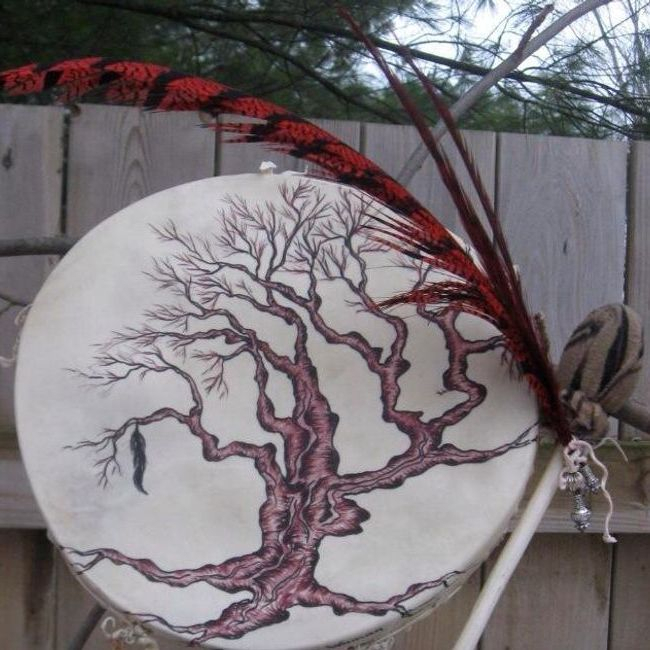 I have given up so many times through out my life and yet something kept pushing me forward. 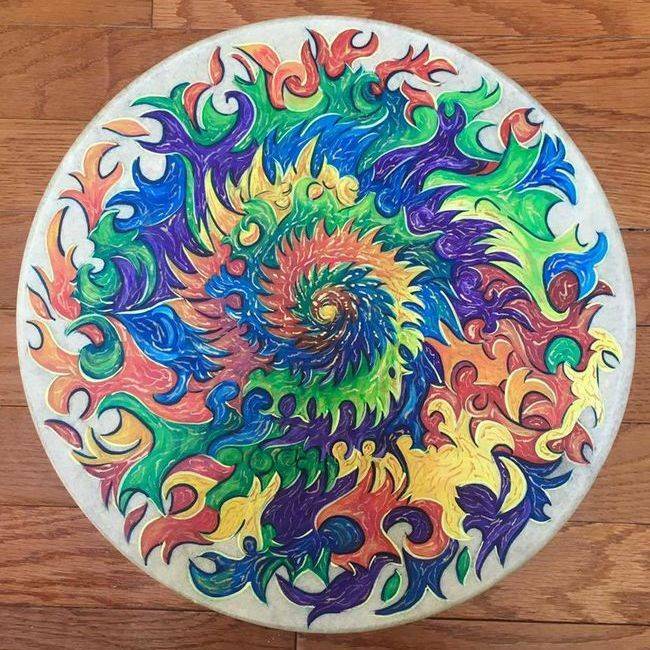 What or who? 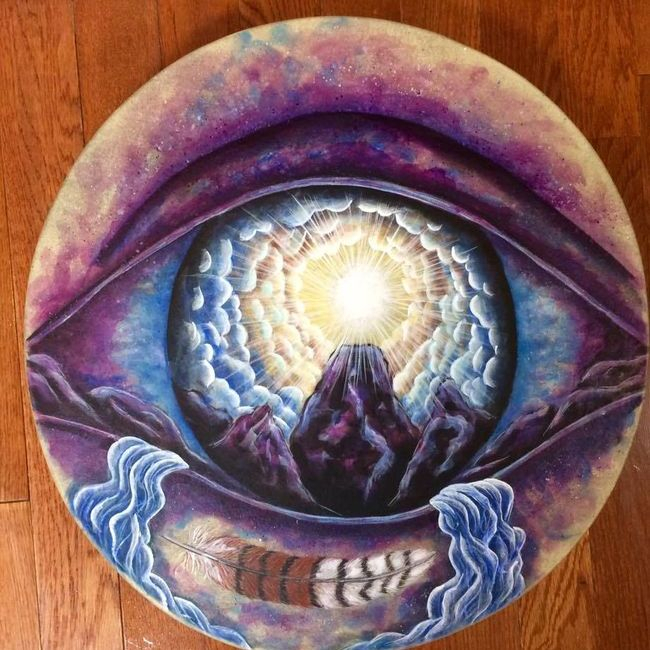 It was my inner self, my inner strength that keeps saying get up, keep going, you can do this. 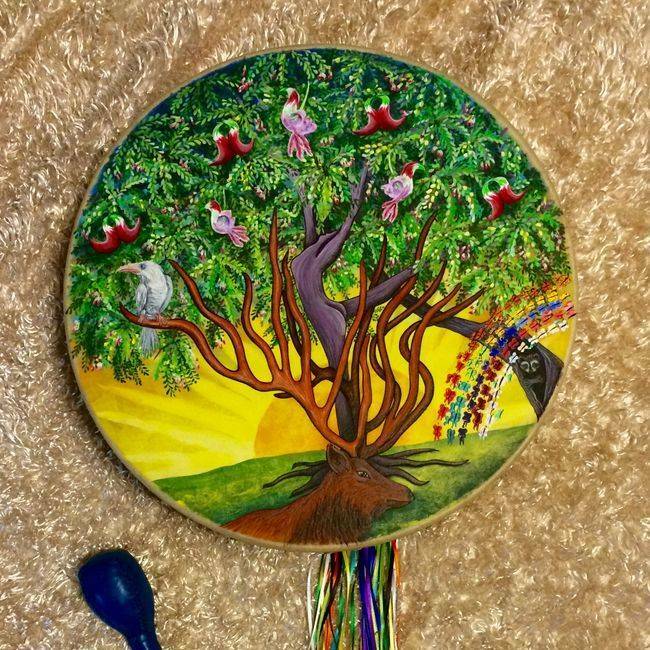 My dreams have been many over my years on this earth and so have the challenges of living. 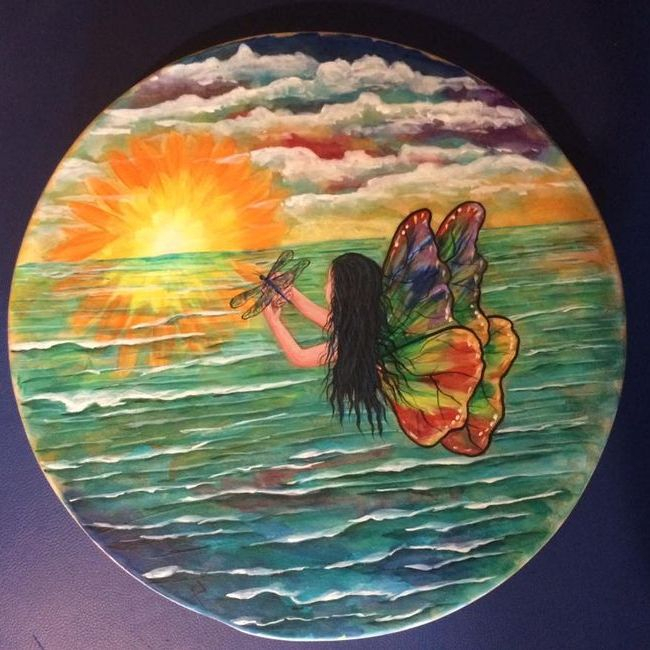 Near death experience, a body that is crippled in chronic pain, emotional trauma exemplified, a brain that is challenged with Asperger’s and a soul that was lost in the chaos of life. 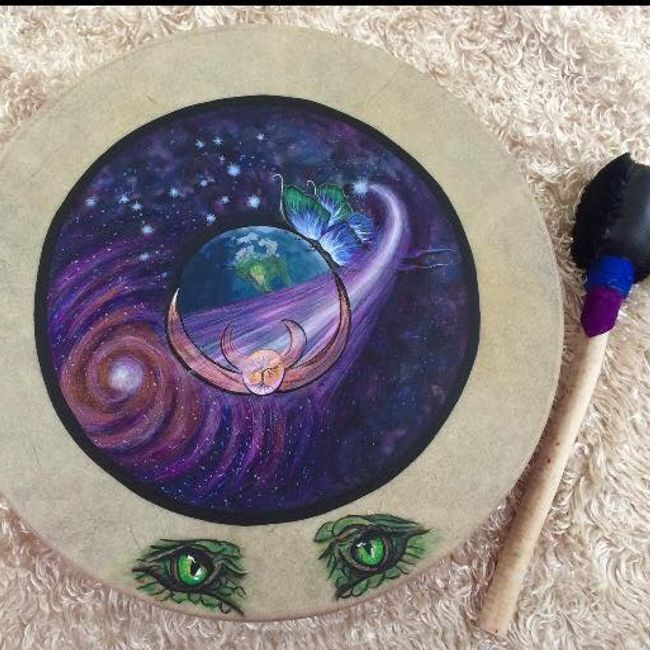 What is there to live for? 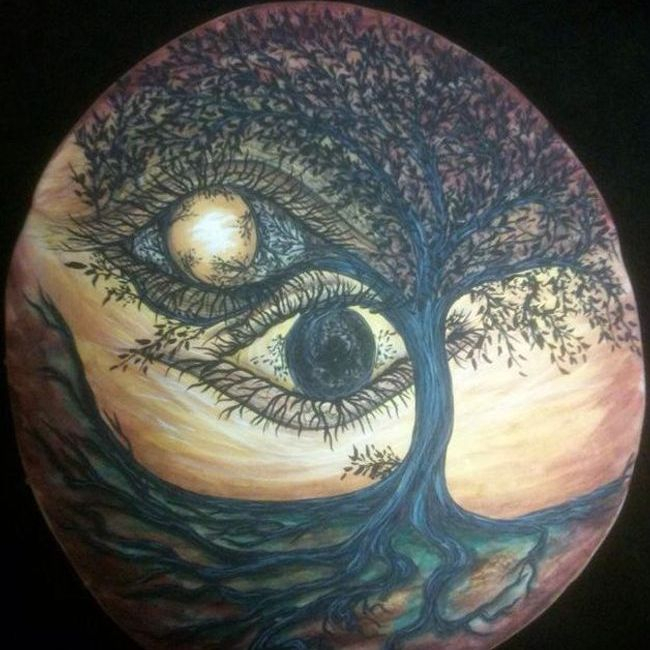 I had given up until one day Spirit stepped in and moved me. 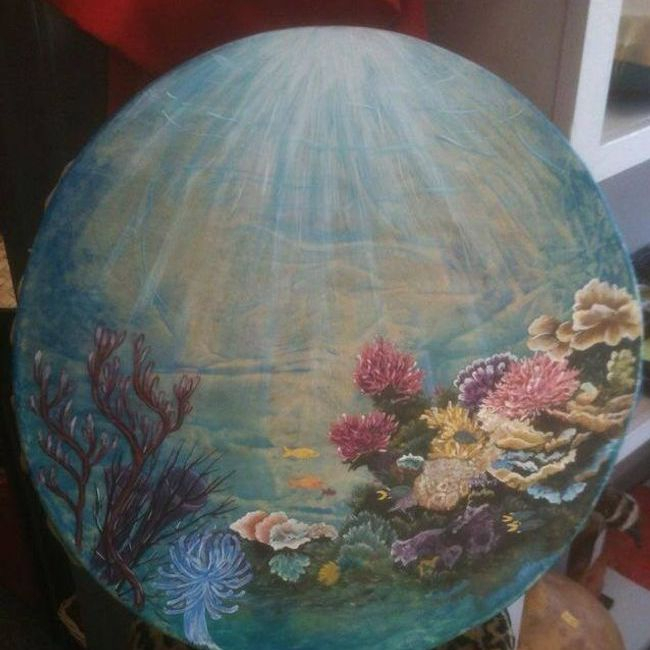 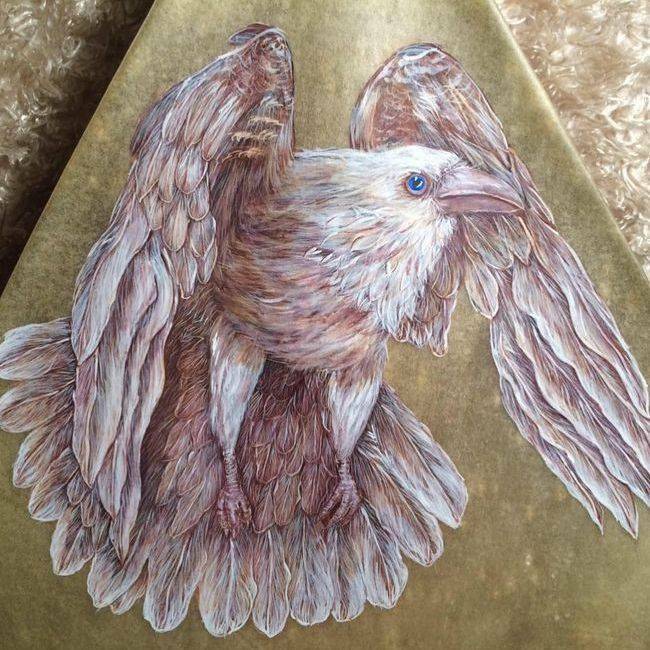 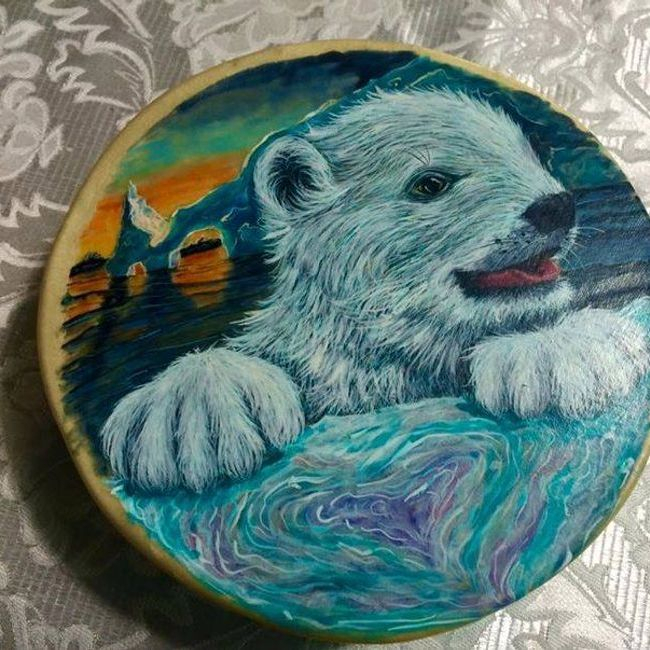 I continued my 40 year dream of being accepted as a professional artist, now selling in eleven countries worldwide. 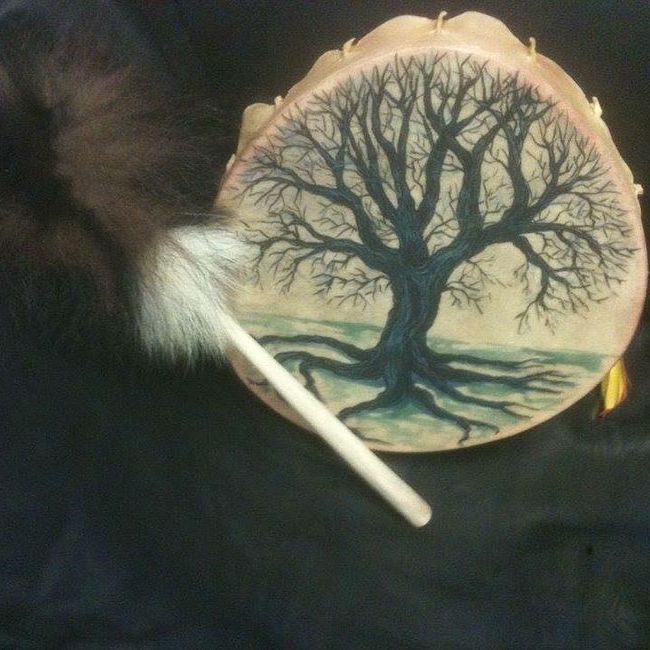 My life story made into a movie called “Anne’s Story” was made by CBC in the early 80’s about domestic violence. 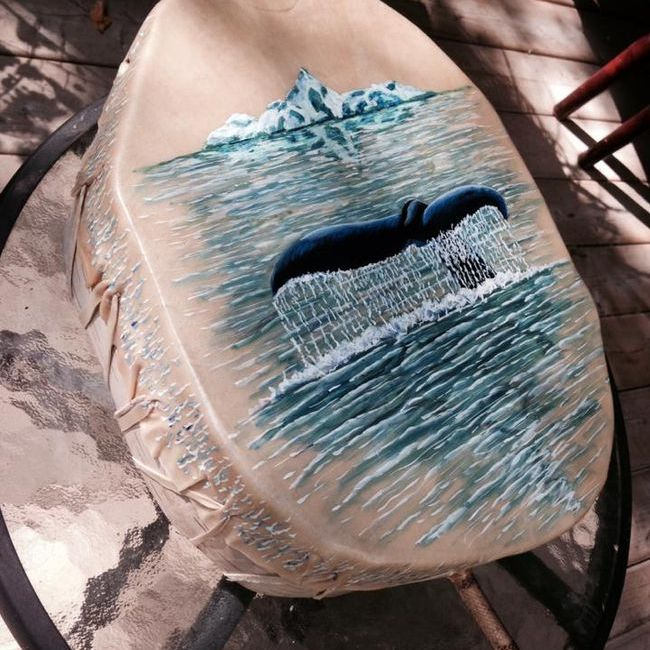 It inspired millions across Canada as it encouraged others to find their voice. 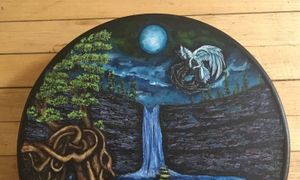 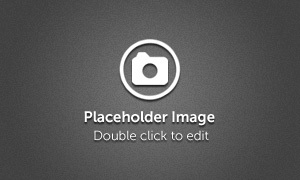 My biography “Challenges of Awakening – Living Parables” goes deeper into the spiritual realm of healing Post Traumatic Stress and other emotional and spiritual difficulties. 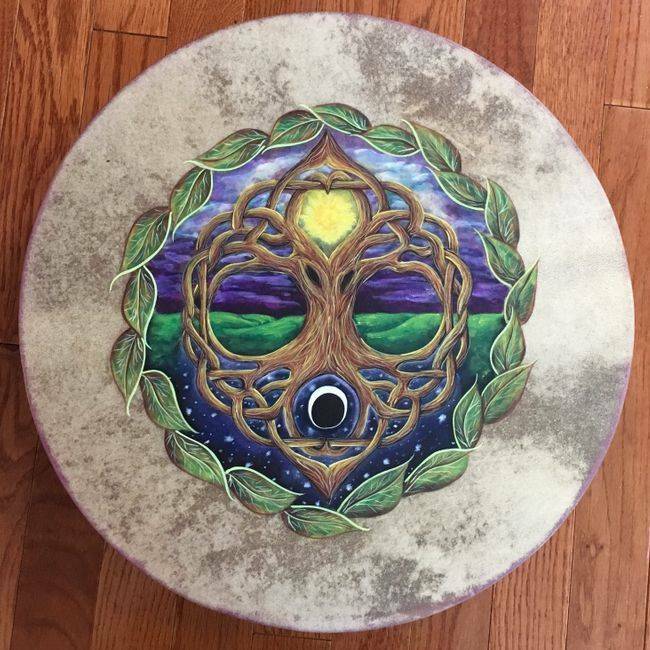 My CD Walking the Path of the Ancients helps clients with stress, and those with Alzheimer’s disease, Autism and Down Syndrome. 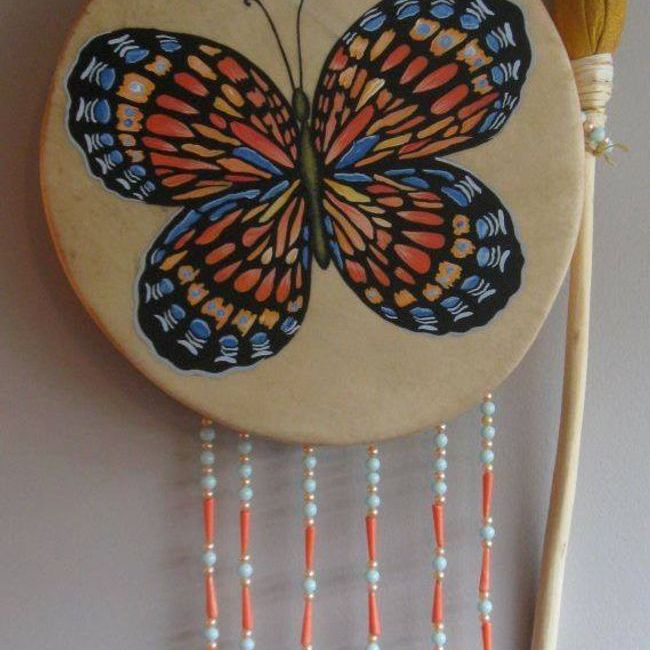 Follow your dreams little one was the direction whispered in my ear from somewhere beyond time and follow them I have.